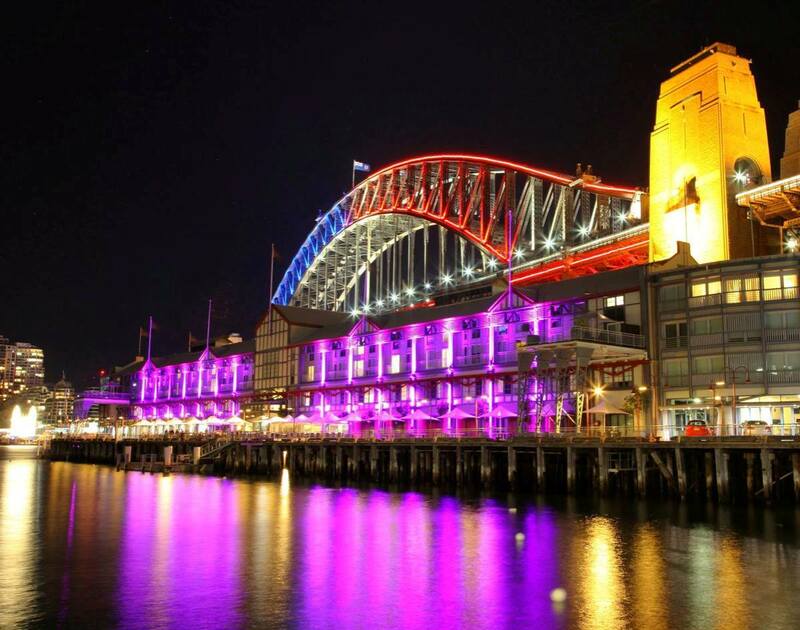 Vivid Sydney, the largest Light, Music and Ideas festival in the Southern Hemisphere, and Australia’s Event of the Year, features a huge, free nightly light show of lighting installations, building projections and water theatre around Sydney Harbour from 6pm until midnight, as well as live music performances and over 200 creative industry events. 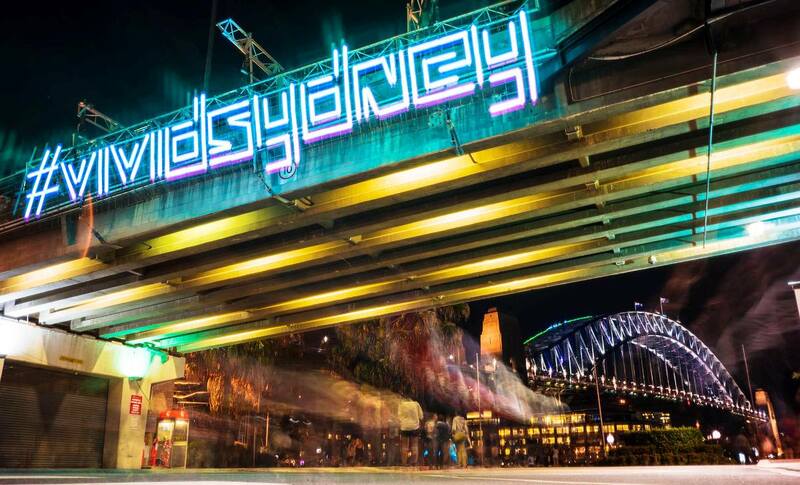 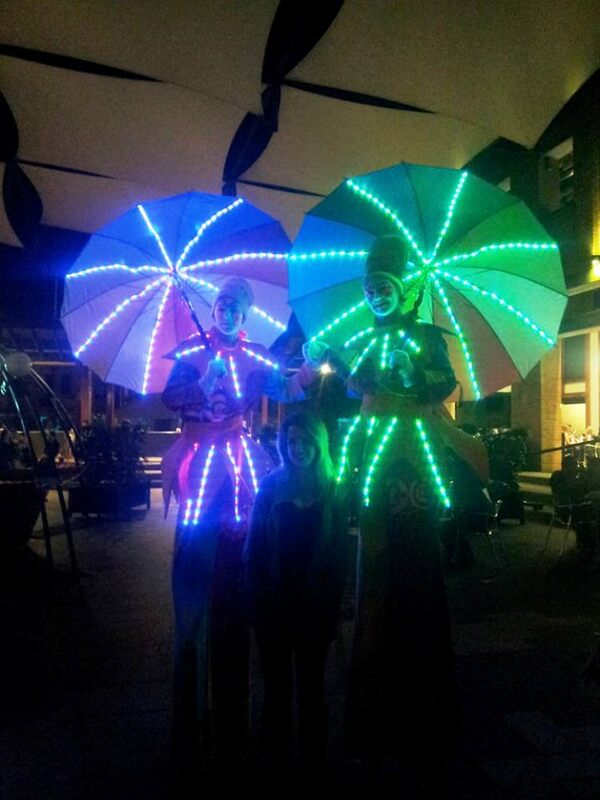 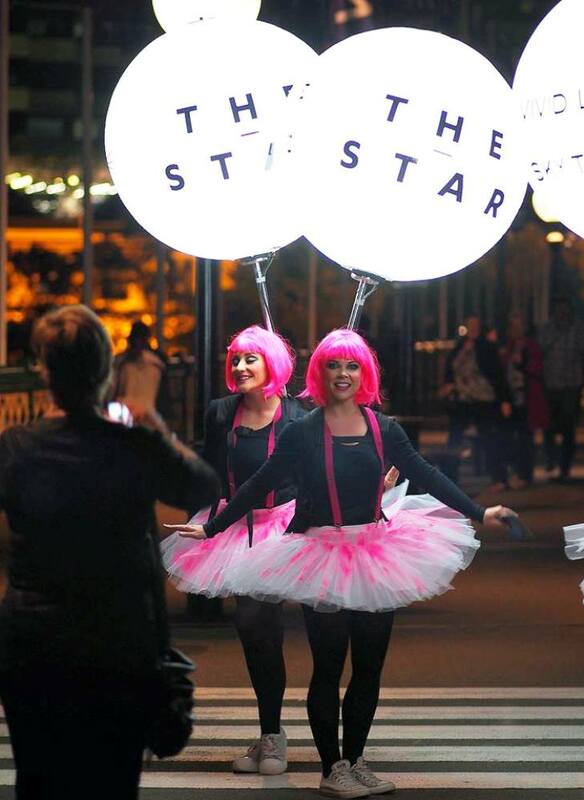 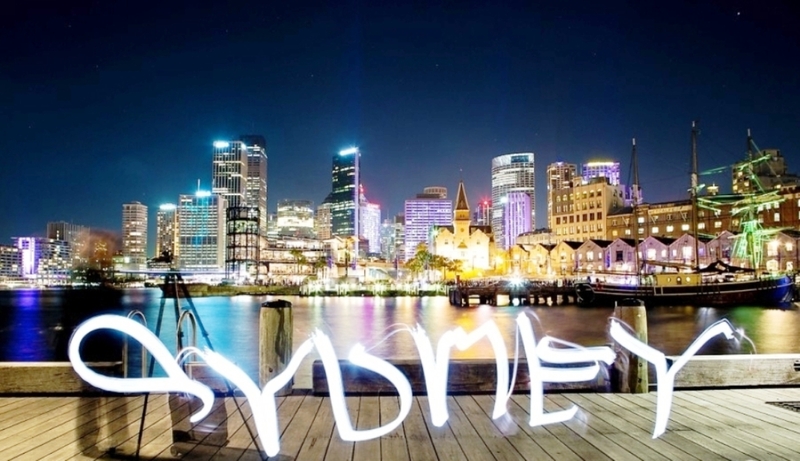 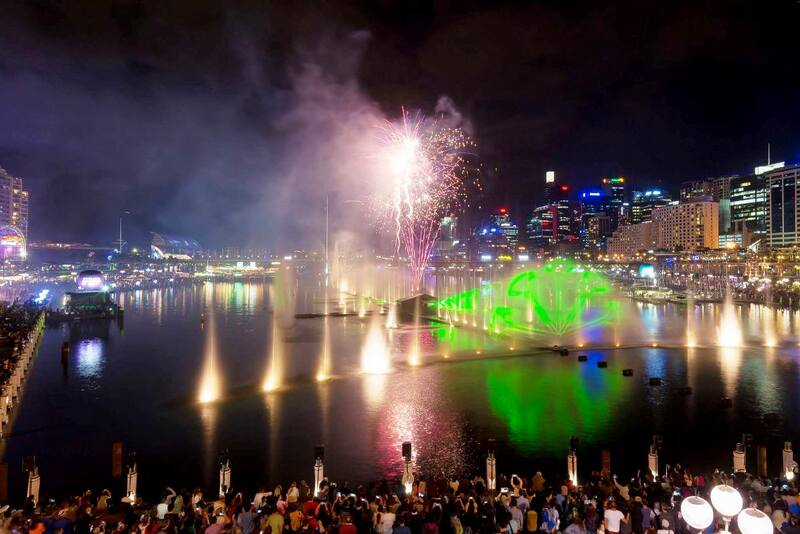 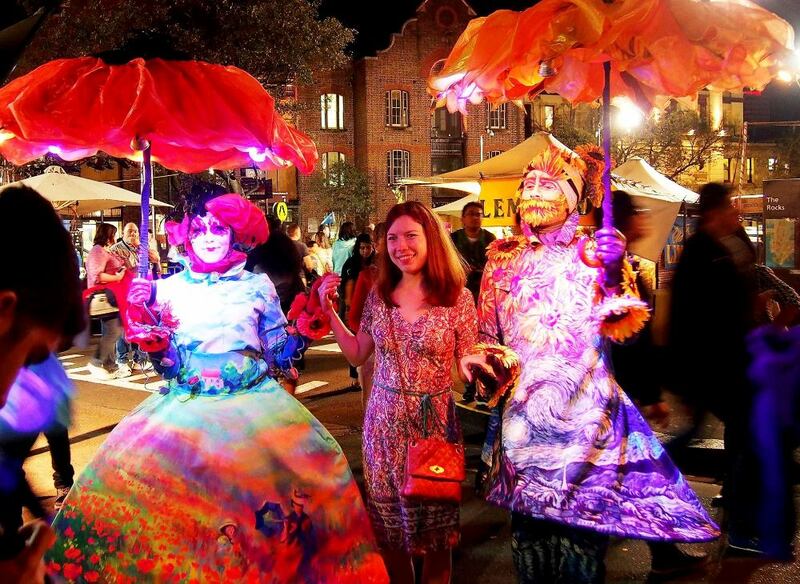 Developed six years ago by Destination NSW, the NSW Government’s tourism and major events agency, Vivid Sydney attracted more than 800,000 visitors in 2013 and contributing more than $20 million in new money to the NSW economy. 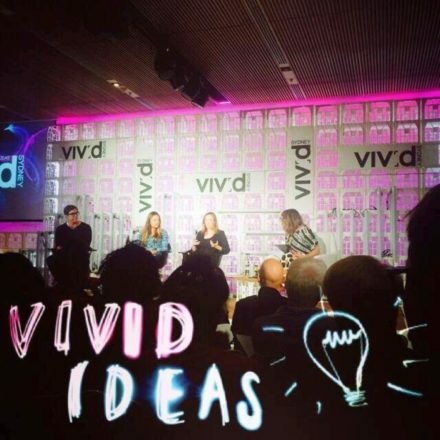 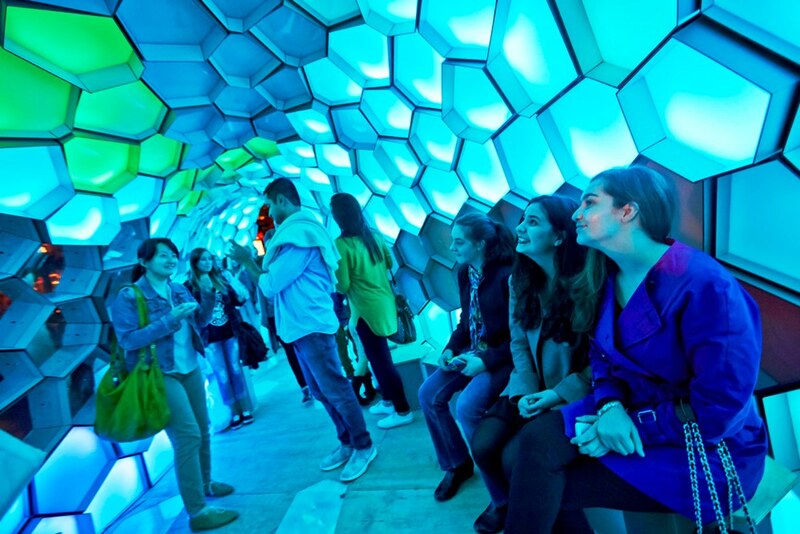 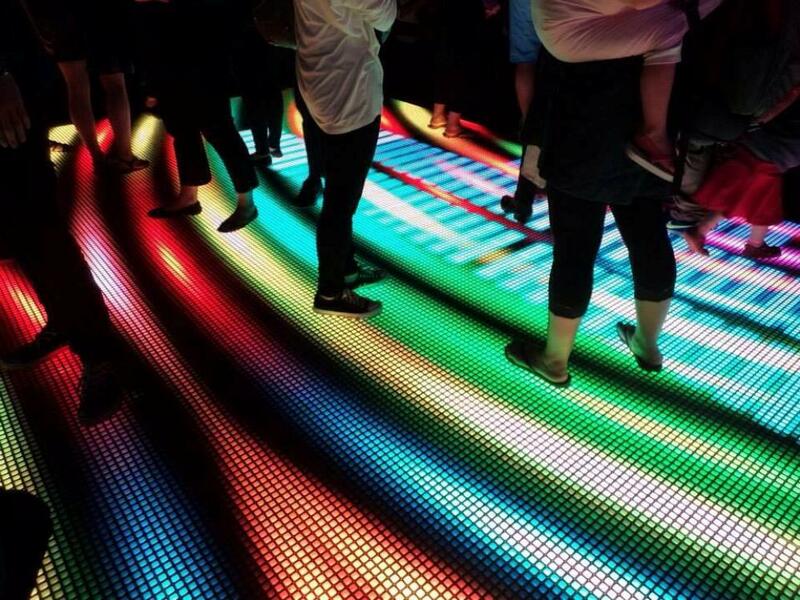 In 2013 visitors snapped up over 51,000 tickets for an impressive program of concerts, conferences, creative product launches and exhibitions at Vivid Ideas and Vivid Music (including Vivid Live). 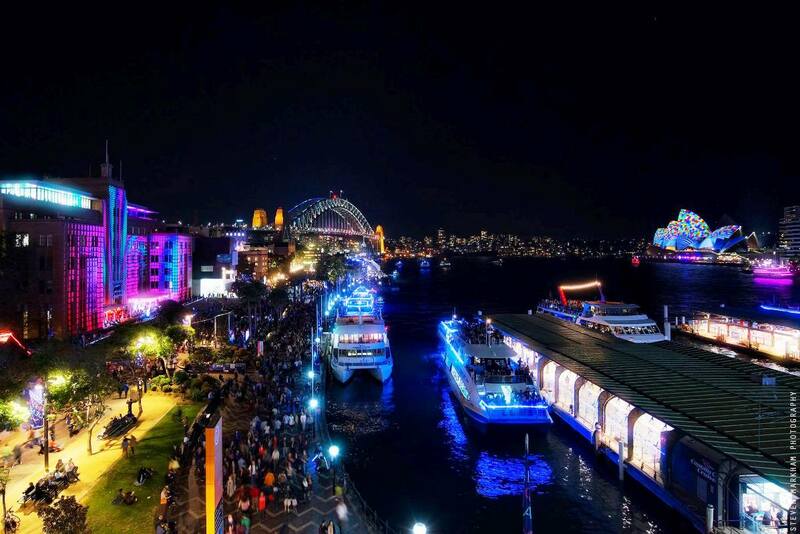 Since kicking off in 2009, Vivid Sydney has given locals – and other Australians lured to the nation’s biggest city – an excellent reason to brave the pre-winter chill, however this years’ Vivid Festival began in unseasonably warm weather, with more people than ever before thronging to Sydney’s Harbour Foreshores. 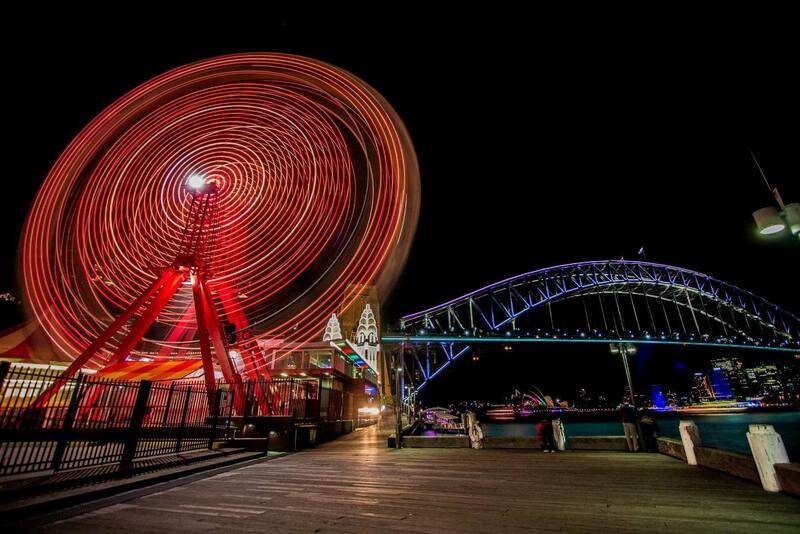 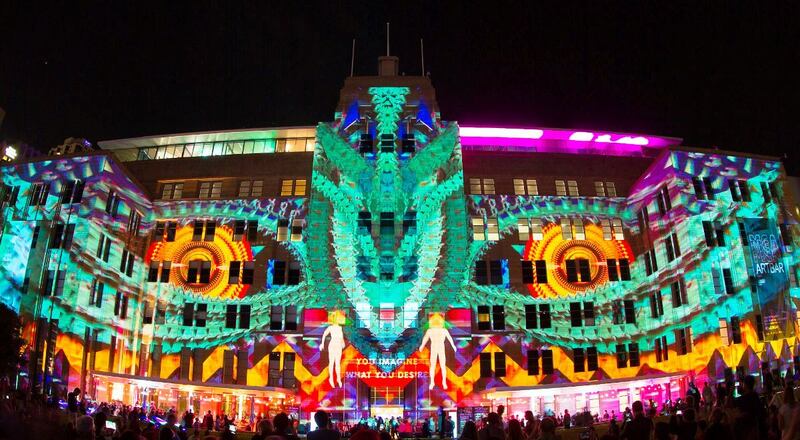 Vivid Sydney is back and bigger than last year with more places lighting up. 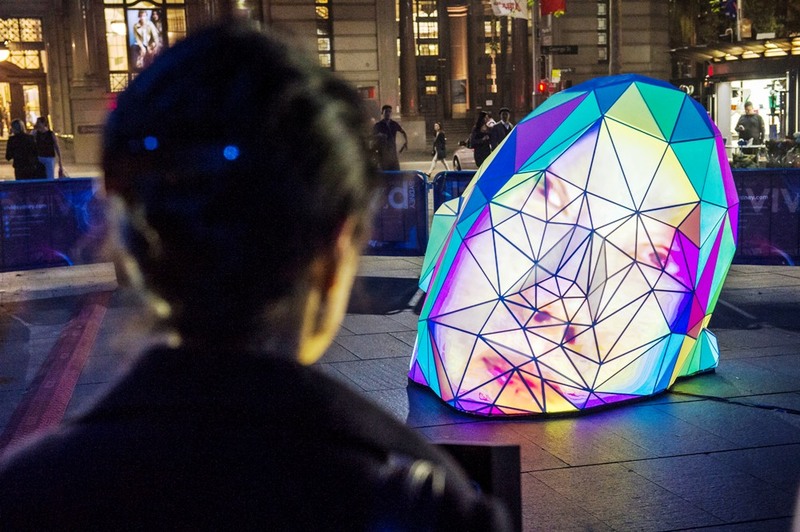 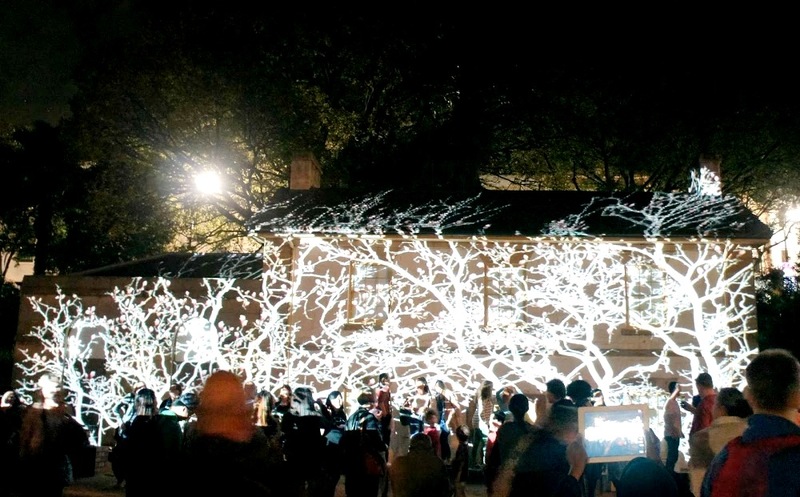 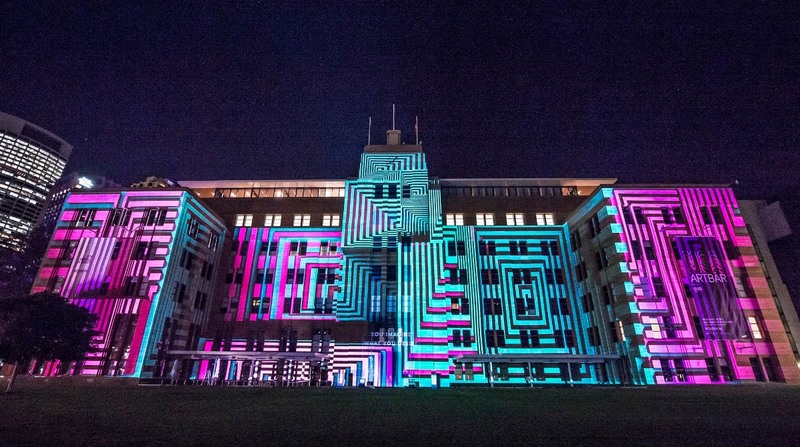 Over 50 spectacular light installations and sculptures await along with 3D mapped building projections. 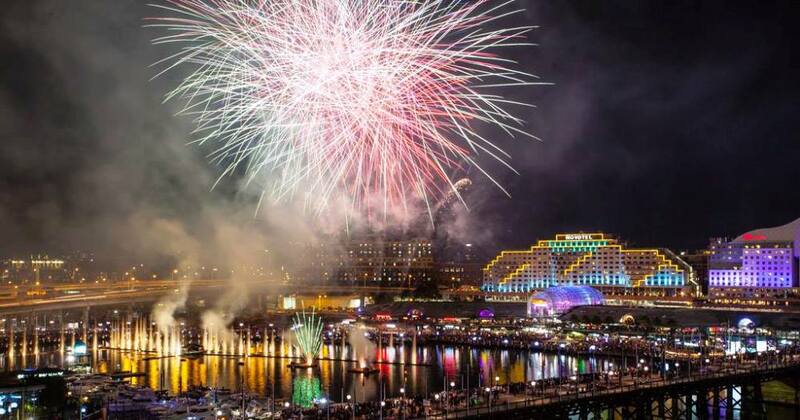 2013 saw Darling Harbour included as well as Walsh Bay, the Sydney Harbour Bridge and North Sydney. 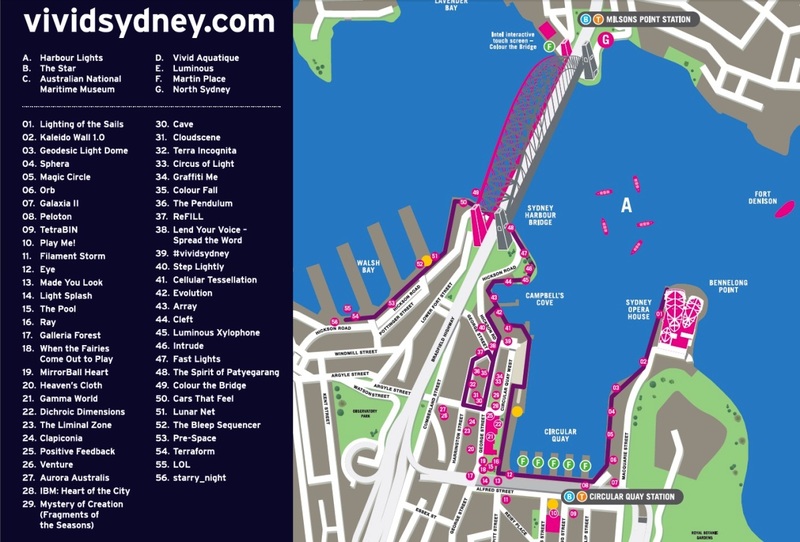 But, as ever, the central focal point of Sydney’s winter festival will still be the Harbour and the Circular Quay precinct. 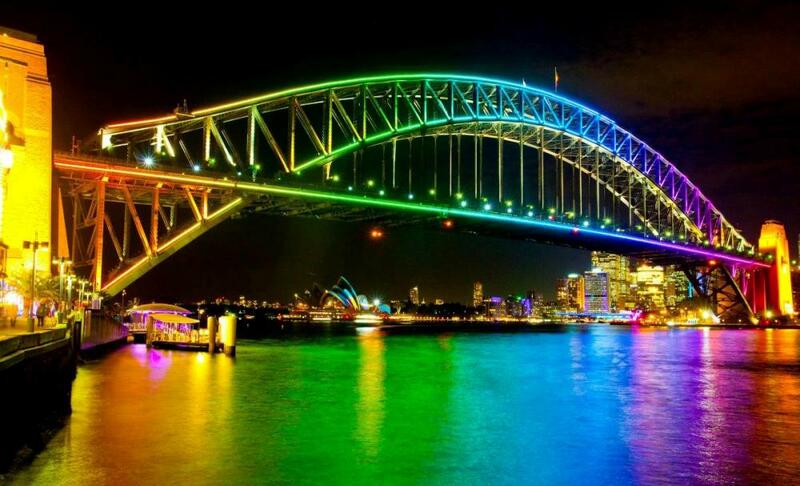 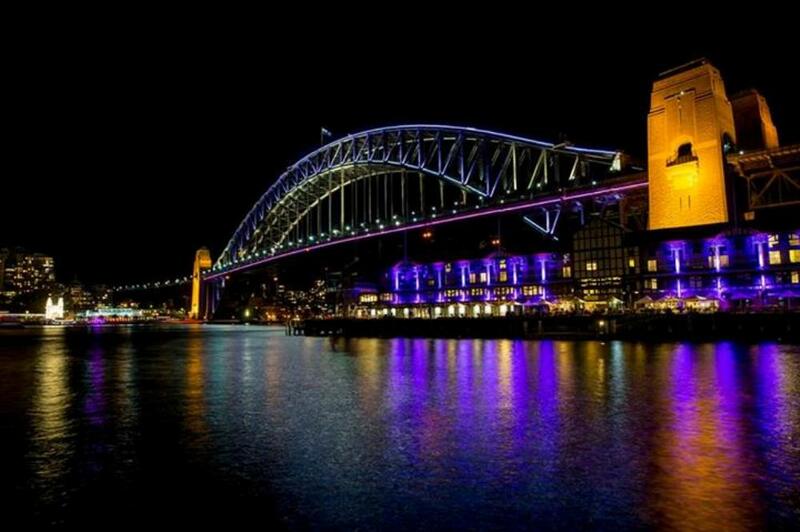 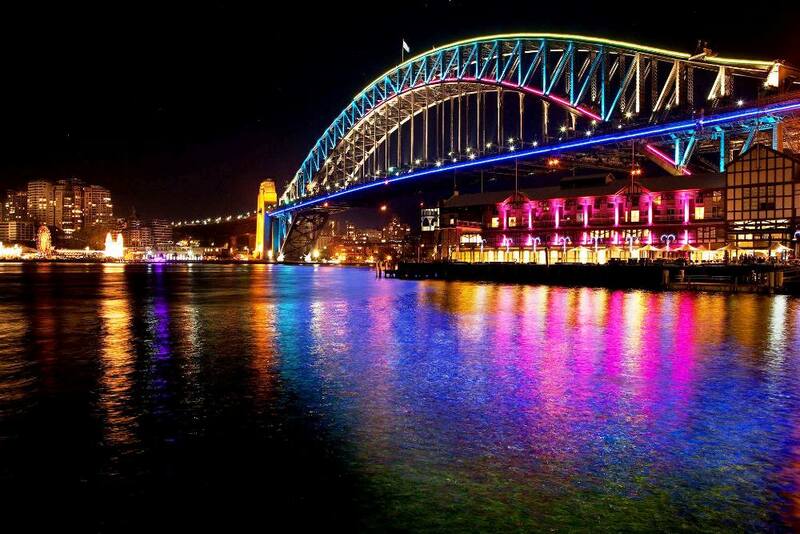 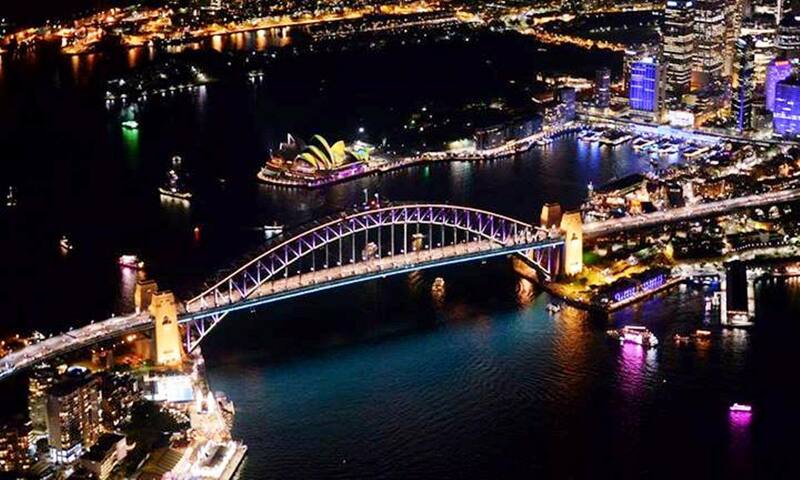 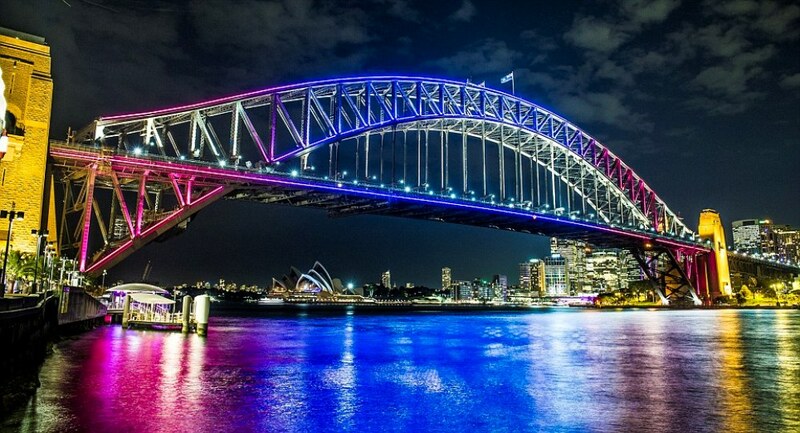 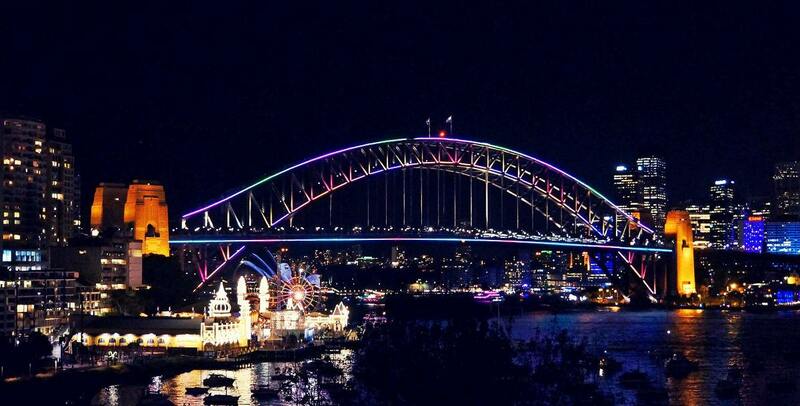 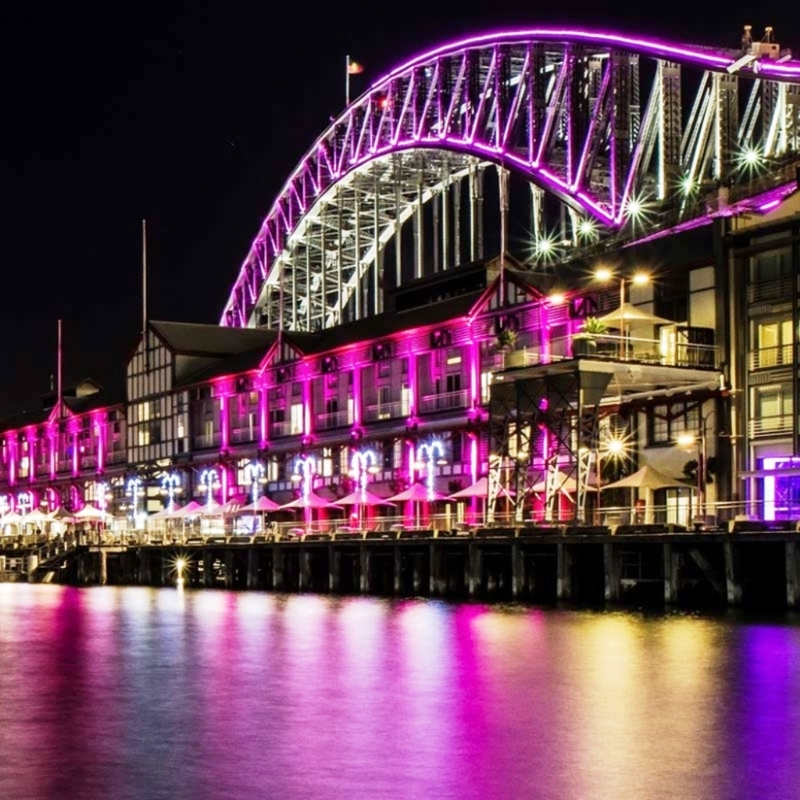 The Bridge will become the world’s largest interactive light display, as visitors are invited to choose the colours they would like to ‘paint’ the Bridge using an interactive touch screen, through a collaboration with Intel and Sydney’s lighting experts, 32 Hundred Lighting. 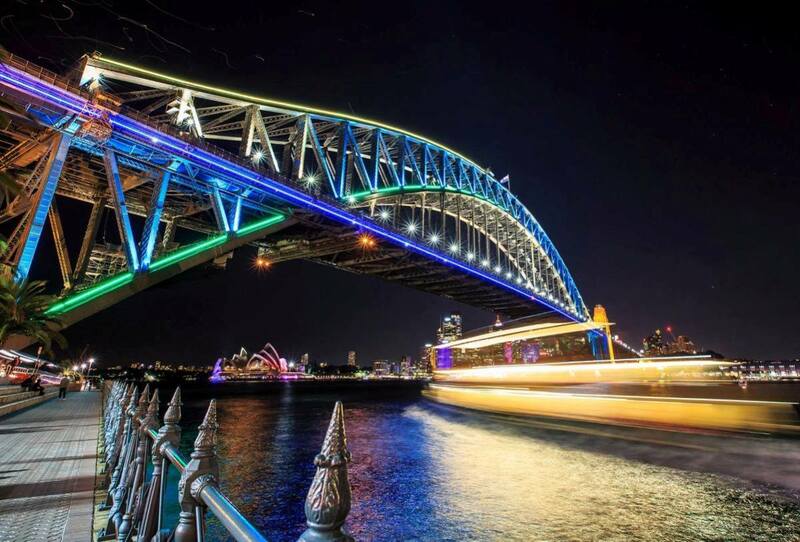 The Harbour Bridge will be illuminated with over 100,000 energy-efficient LED lights, with cruise vessels, boats and water taxis also joining in with LED lights that change colour as they move through different parts of the harbour. 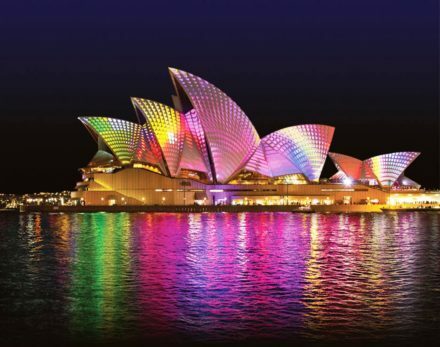 Vivid vest where your heartbeat brightens up the summit in your own personal show of light. 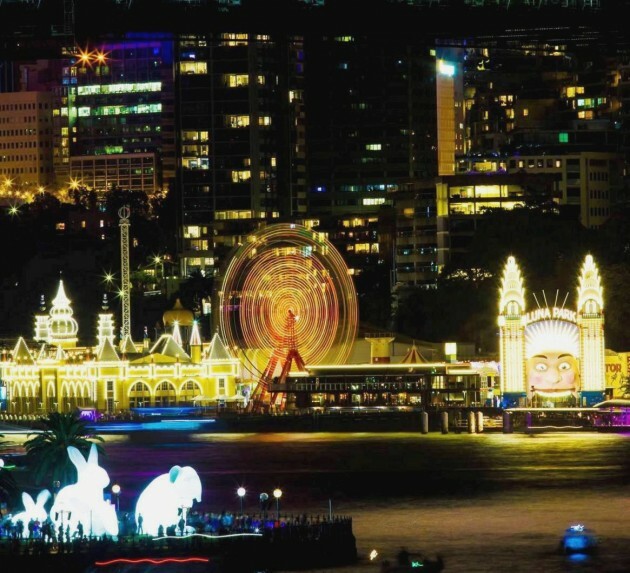 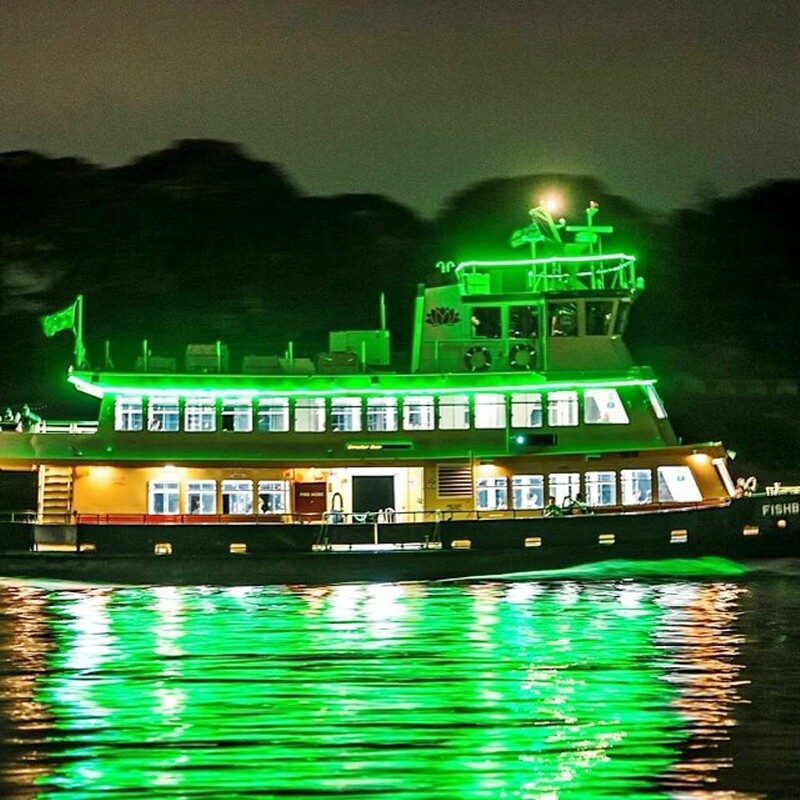 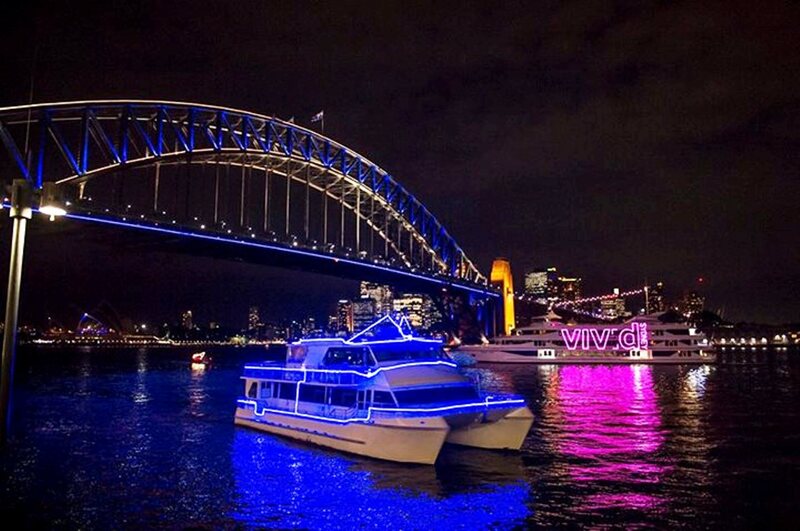 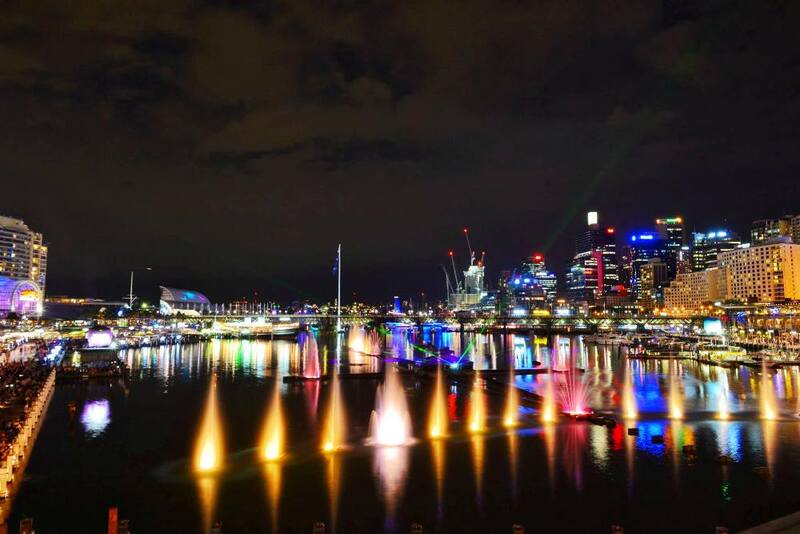 Ferries, cruise vessels, and water taxis are also joining in with Vivid Lights using LED lights that change colour as they move through different parts of the harbour. 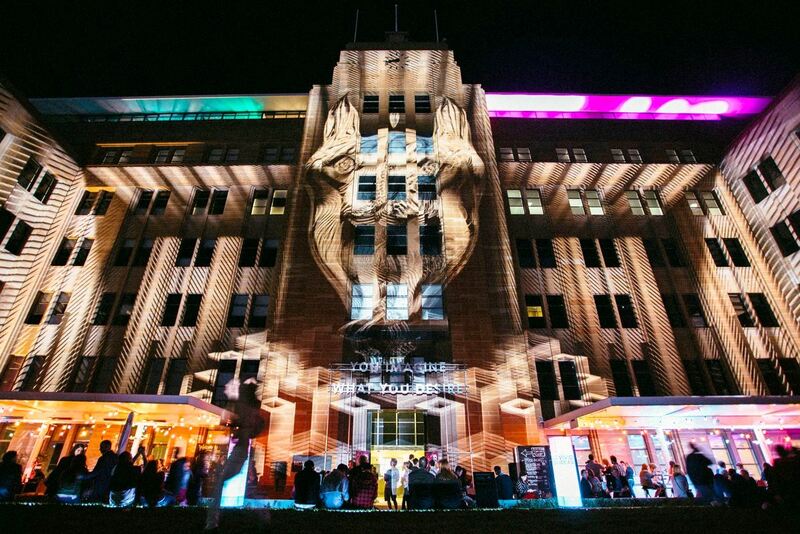 • The Incredibly Short Film festival at North Sydney Olympic Pool. 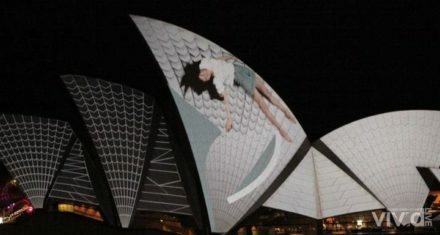 The Vivid Light shows are among the festival’s biggest drawcards, with the Lighting of the Sails being the most popular. 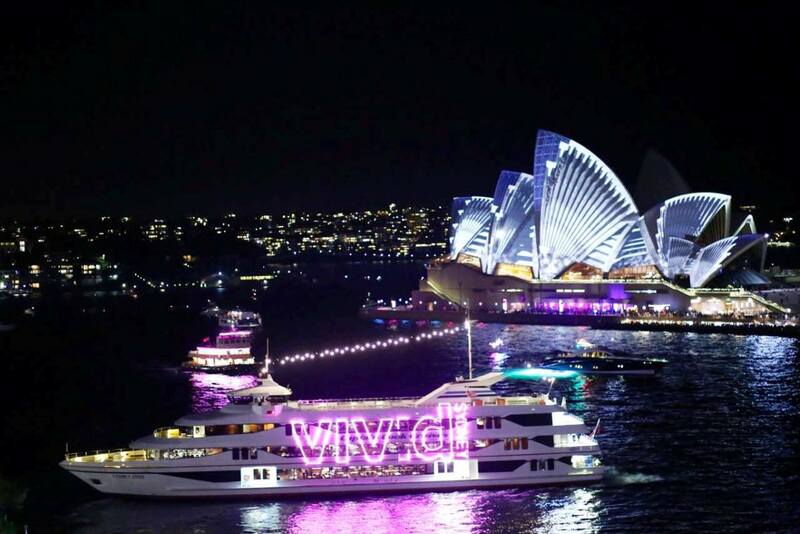 Vivid Sydney was officially opened as the Sails of iconic Sydney Opera House came alive with world–exclusive, stunning 3D–mapped projections, and the Harbour City was filled with colour and light. 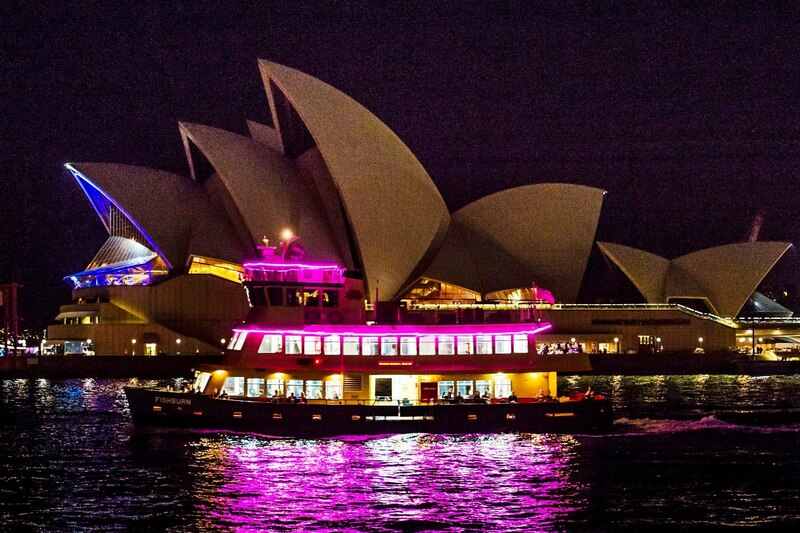 A key highlight of Vivid Sydney is always Lighting the Sails of the Sydney Opera House which this year have been designed by award–winning creative agency 59 Productions, renowned for their work on the London Olympic Games’ Opening Ceremony and the West–end show War Horse. 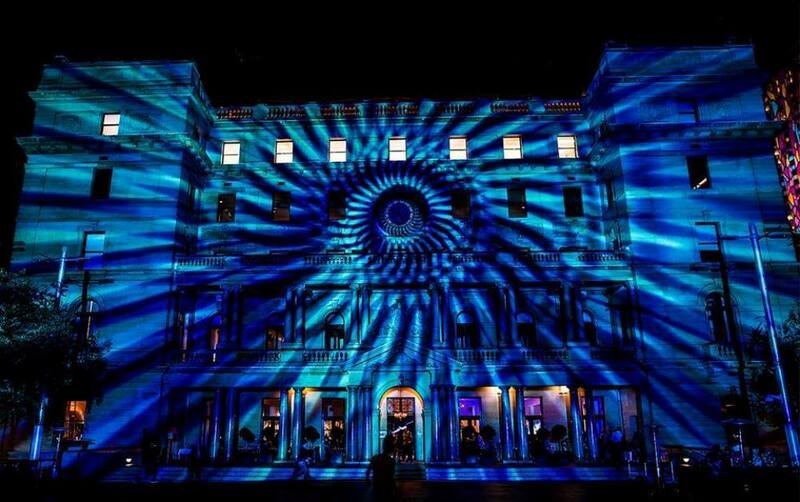 59 Productions take us on a journey through time from the birth of civilisation and architecture through to human and technological achievement. 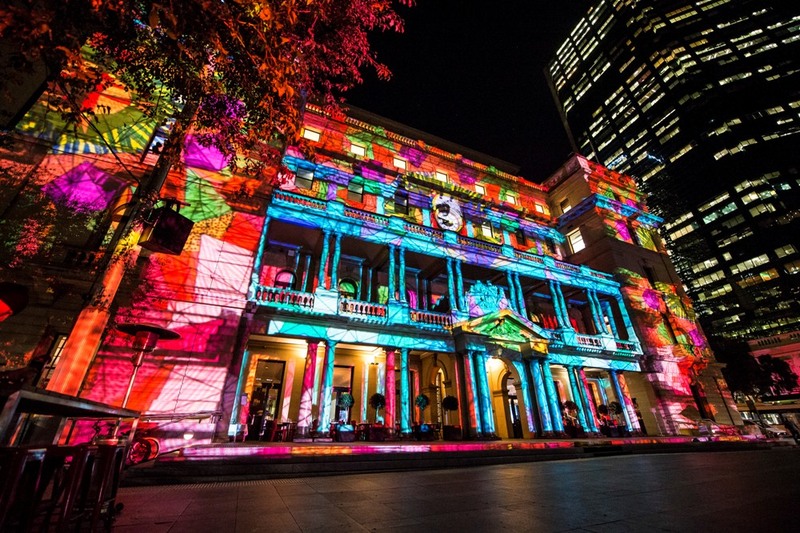 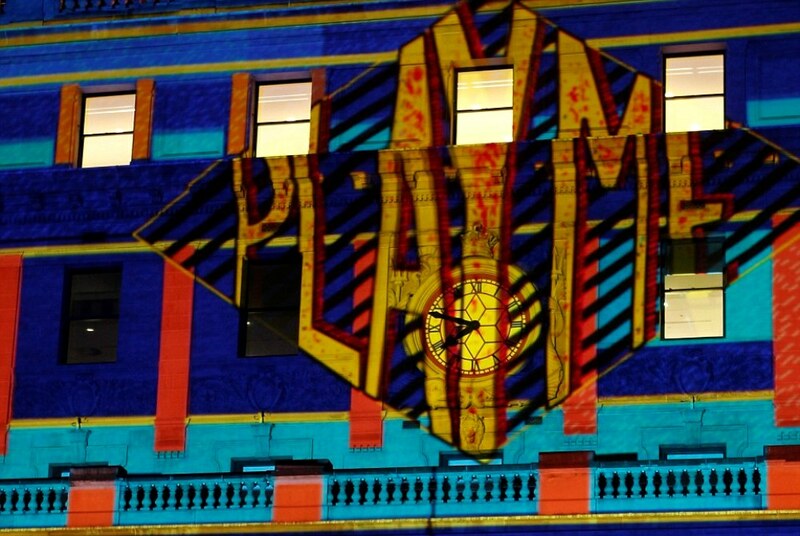 Vivid Sydney is delighted to welcome back French projection gurus Danny Rose, the design team that last year created an extravaganza of colour and light on the façade of Customs House, with Move Your Building. 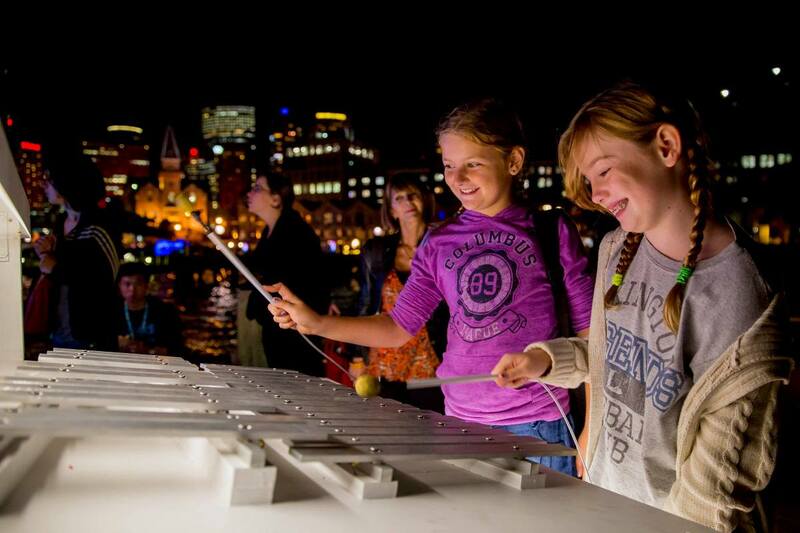 This year Danny Rose has turned Customs House into a sequence of amazing interactive musical instruments. 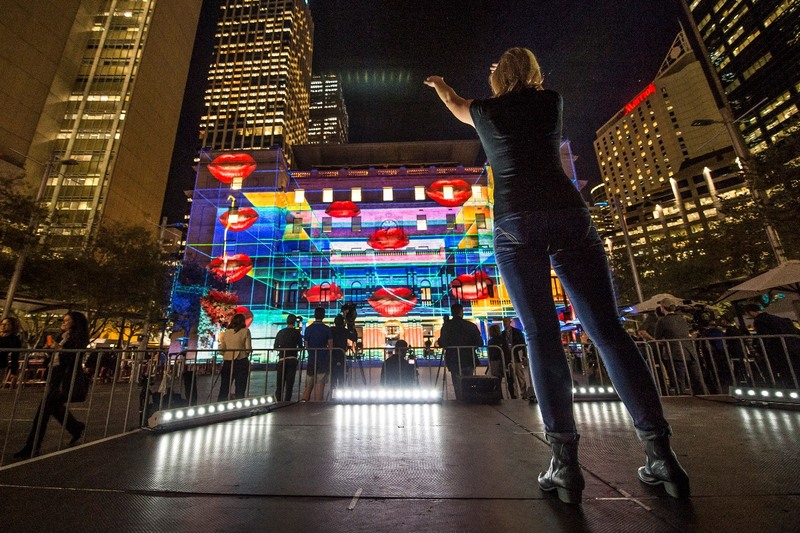 You select one of the ‘musical sculptures’ from a touch screen, get onto a platform in front of Customs House and ‘play’ the sculpture, bringing it to life in glorious torrents of ever-changing colour, light, form and sound. 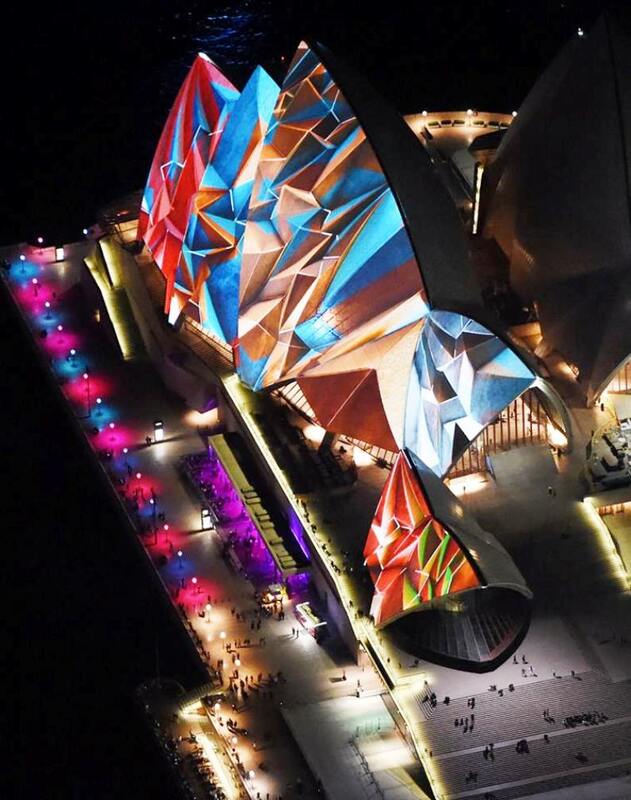 Sydney’s visual content masters Spinifex Group, whose credits include two Olympic Games and a World Expo, worked with Australian artist Jess Johnson to transform the original façade of the Museum of Contemporary Art. 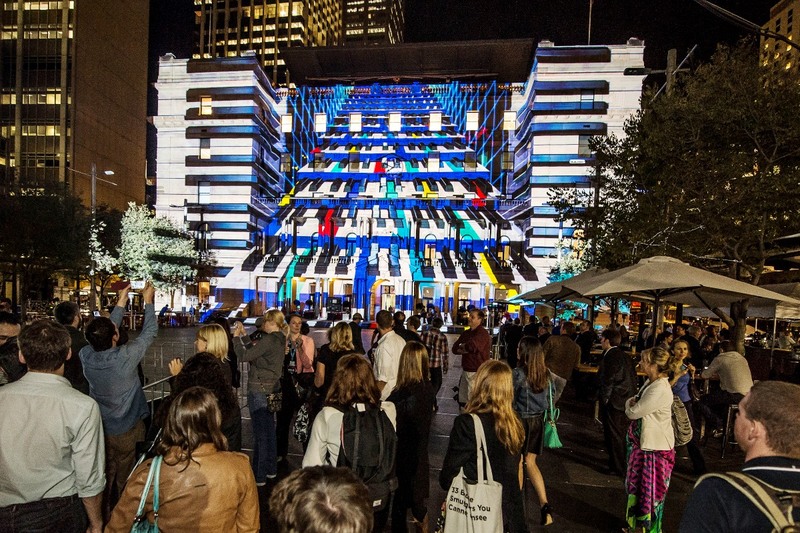 Inspired by artist Jess Johnson, the MCA building morphs into an interactive and dynamic performance space, coming to life, changing its appearance, and even seeming to change its structure at times through the use of isometric designs, old school gaming, pop up 3D books and forced perspective. 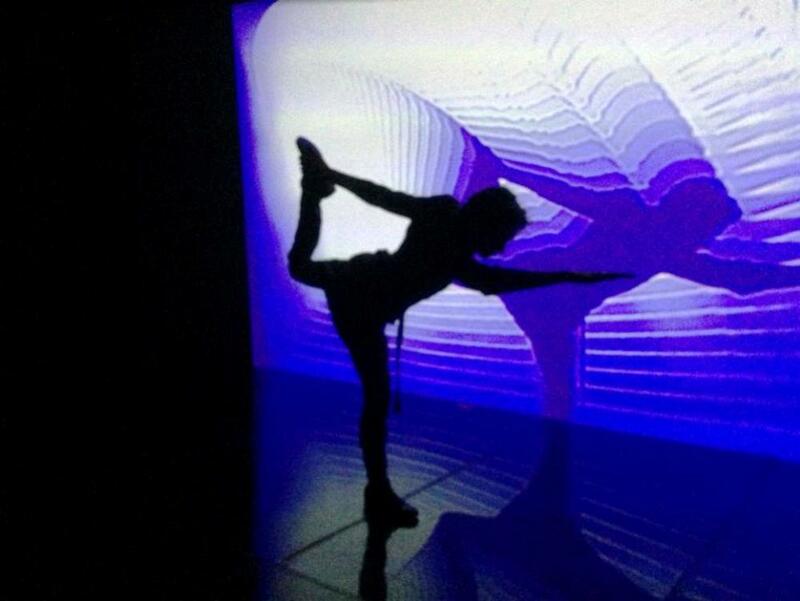 As each chapter evolves we have built drama and emotion through animation and 3D visual effects tricks that will take the viewer on an abstract, emotional and playful journey through constantly changing worlds. 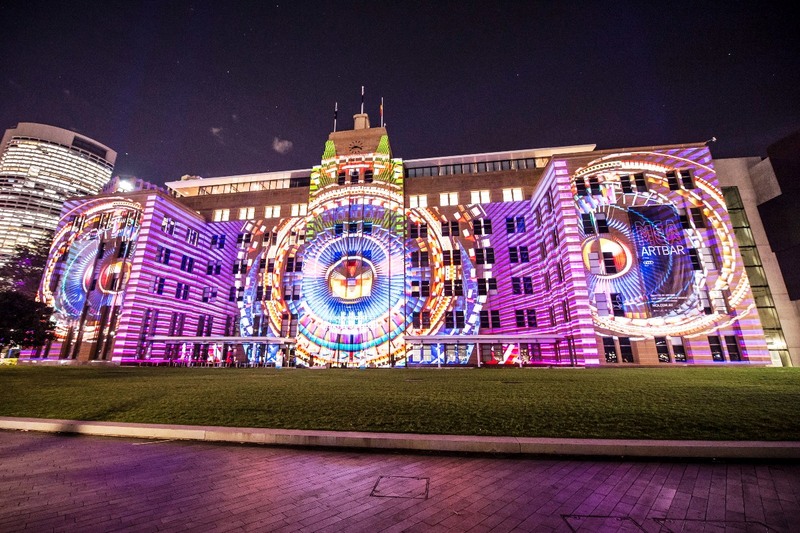 In another Vivid Sydney first, the light and laser installation, Filament Storm, will play out on the façades of five Circular Quay skyscrapers, and feature six high powered 10-watt lasers, plus the latest in giant theatrical lights from the world’s largest lighting company, the Production Resource Group. 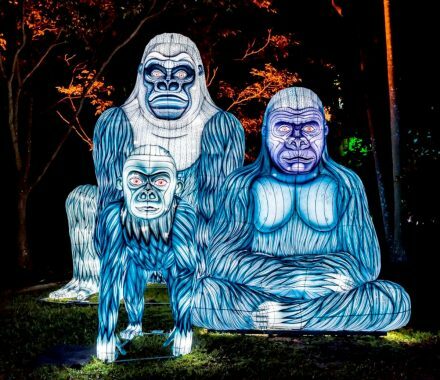 These lights, known as the Best Boy and the Bad Boy, are less than a metre tall, weigh as much as a person and can light an entire skyscraper with a single instrument. 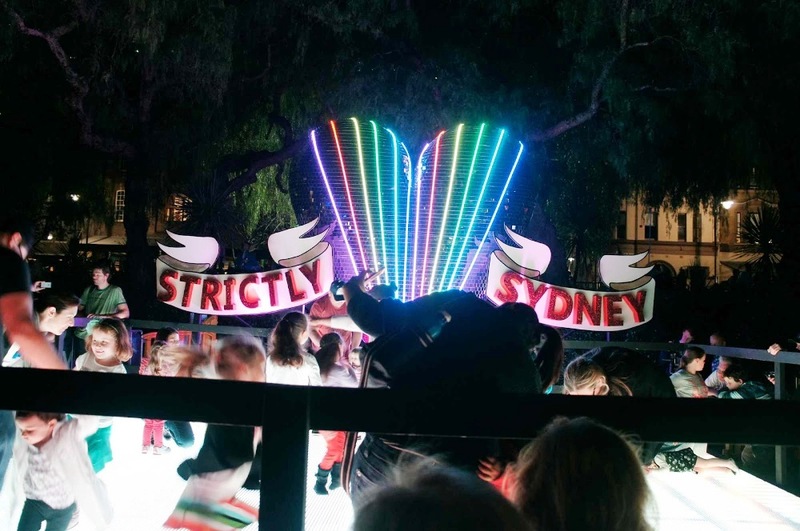 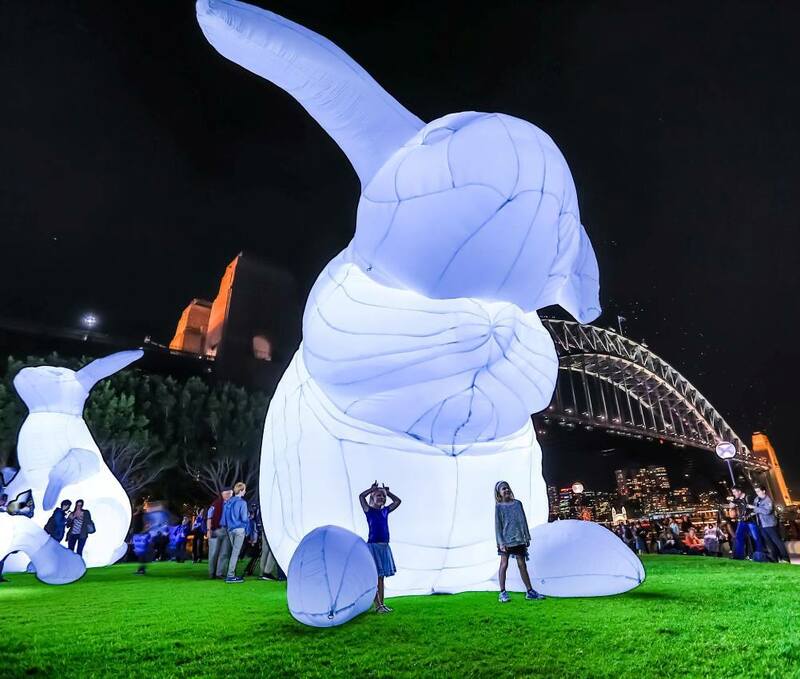 The family-friendly Light Walk winds its way between Sydney Opera House and Walsh Bay with a series of ‘light art’ sculptures, projections and installations. 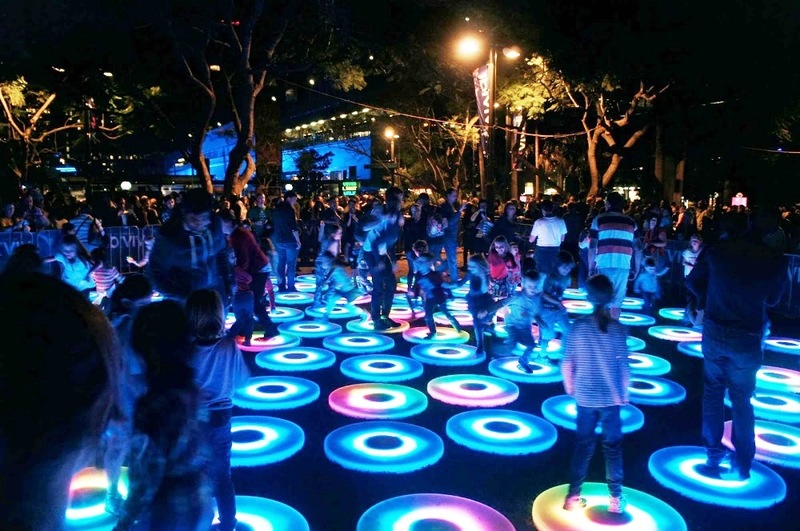 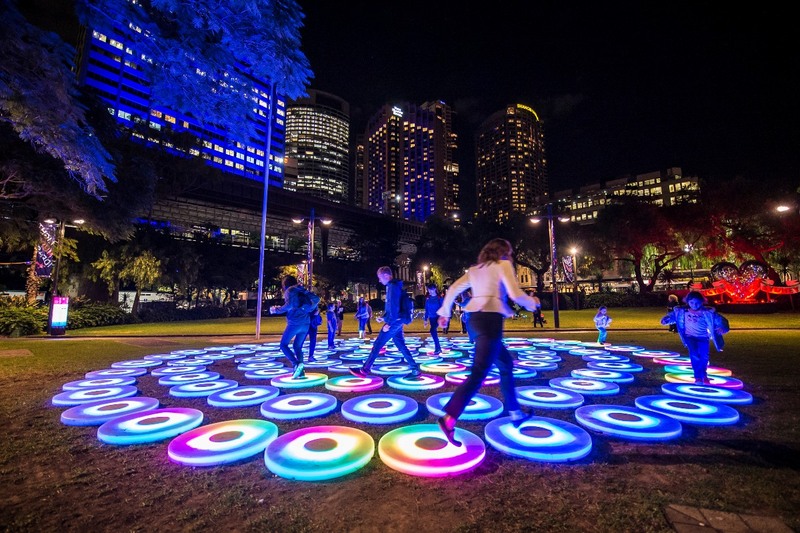 Take the Light Walk with some amazing sculptures and installations including the interactive Pool in First Fleet Park, the Geodesic Light Dome and the glowing Orb. 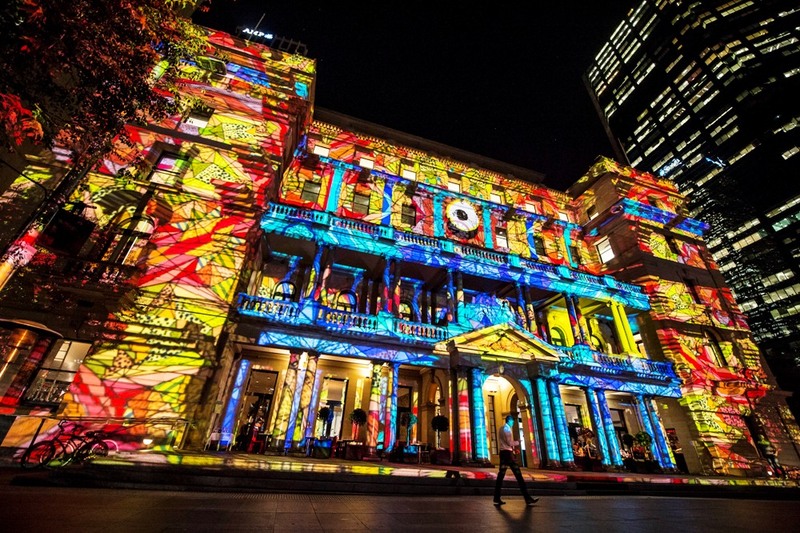 Sandstone will shine like never before at Customs House and the MCA, and over 50 light installations will enthrall along the Vivid Light Walk. 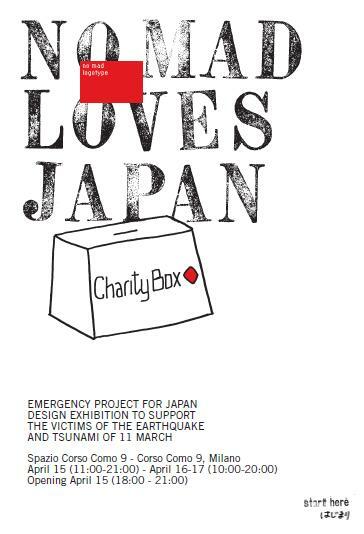 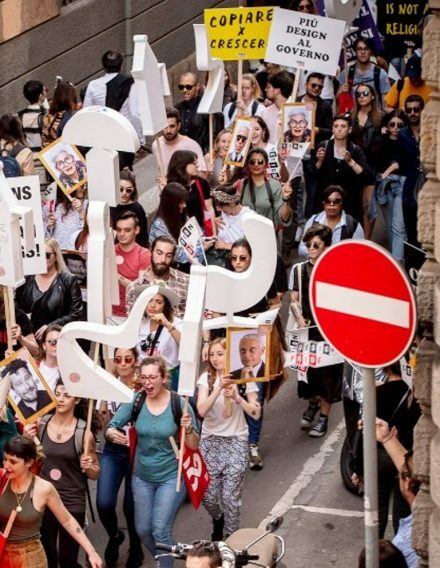 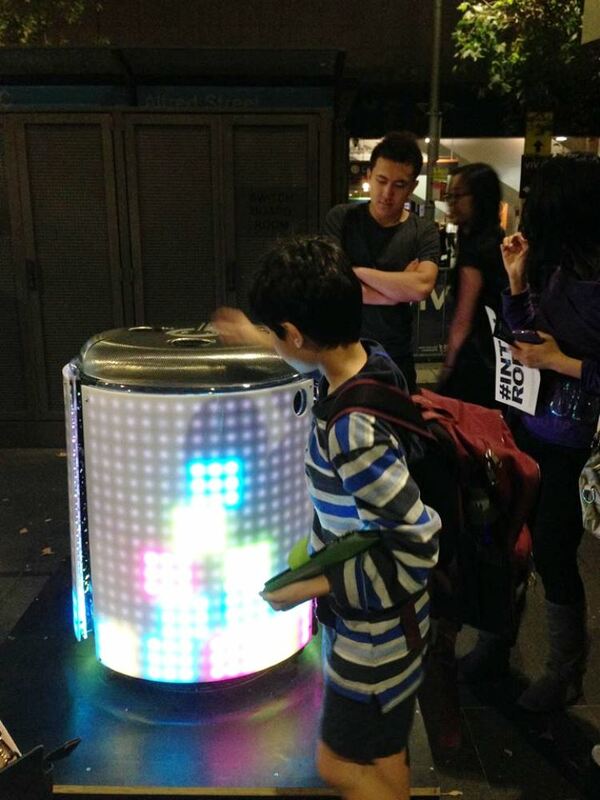 Some have a message, some are pure fun, many are interactive and all of them are free. 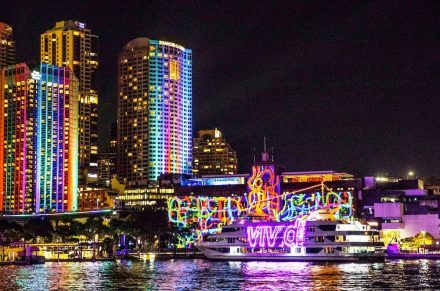 Wherever you choose to start and finish; the Light Walk is a beautiful way to experience Sydney Harbour on a winter’s night. 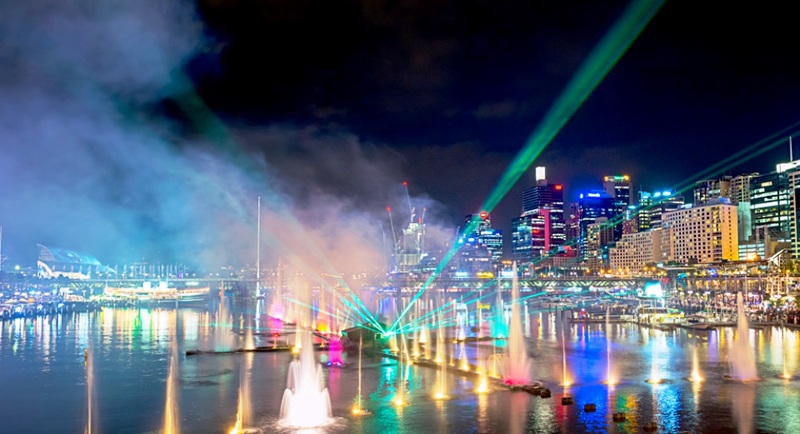 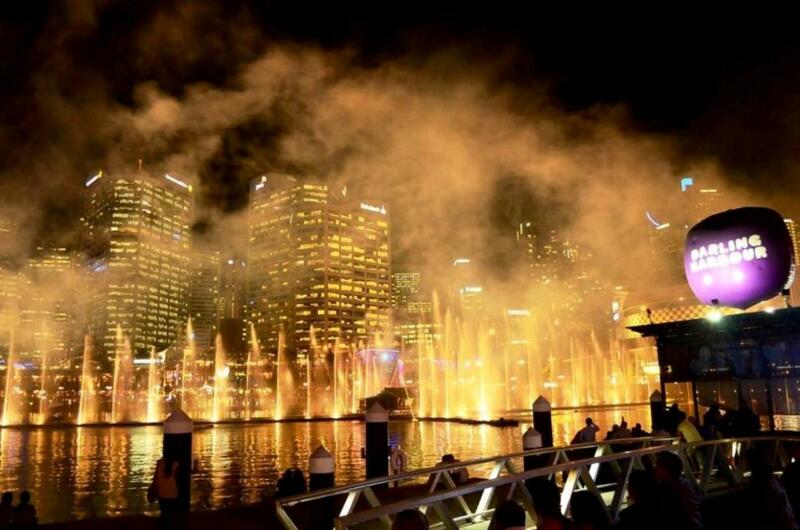 The Darling Harbour water theatre will once again transform two thirds of Cockle Bay, with giant fountains, four major water screens, lasers, projections and pyrotechnics from the French master fontaneers, Aquatique Show International, whose Vivid show is twice the size of last year’s and is designed as a theatre in the round. 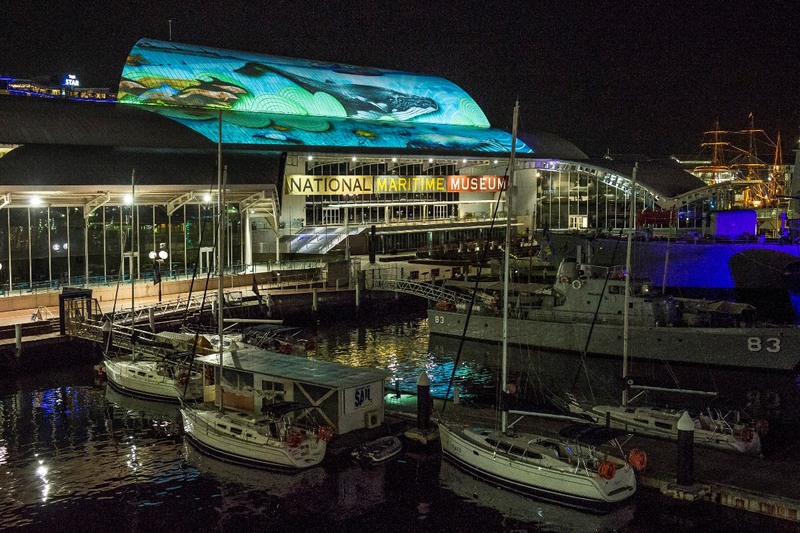 Also see rooftop projections on the National Maritime Museum, which will bring to life the world of marine animals. 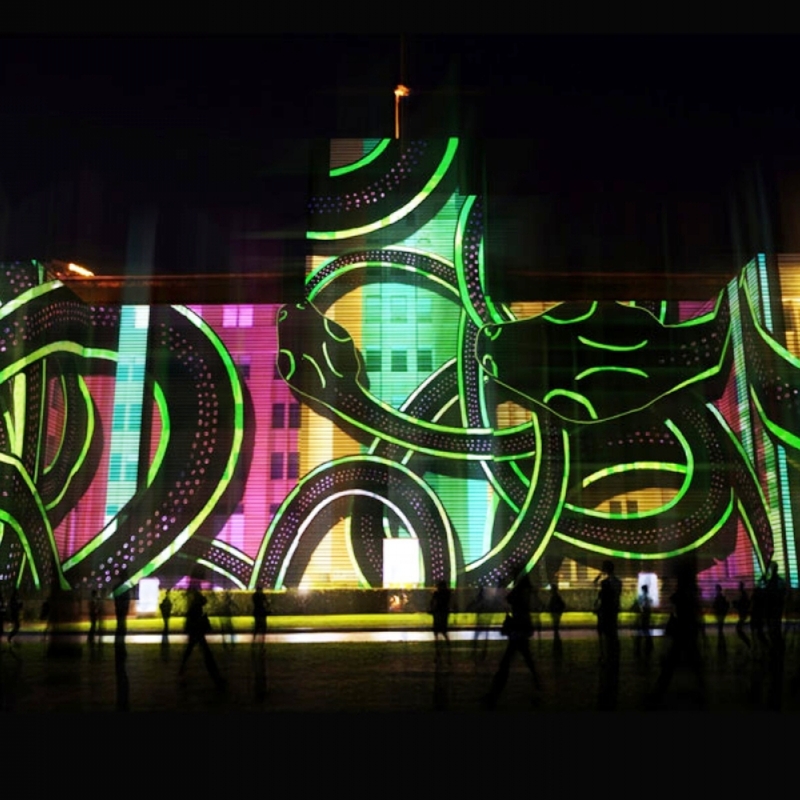 Multi-award-winning The Electric Canvas are projecting for the first time, on the entire facade of the Astral Tower, the Darling hotel and the Sky Terrace rooftop will be transformed into a light show. 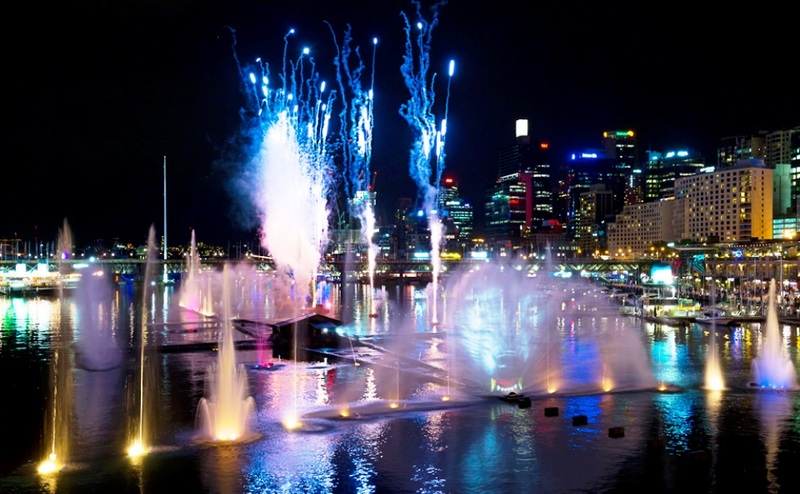 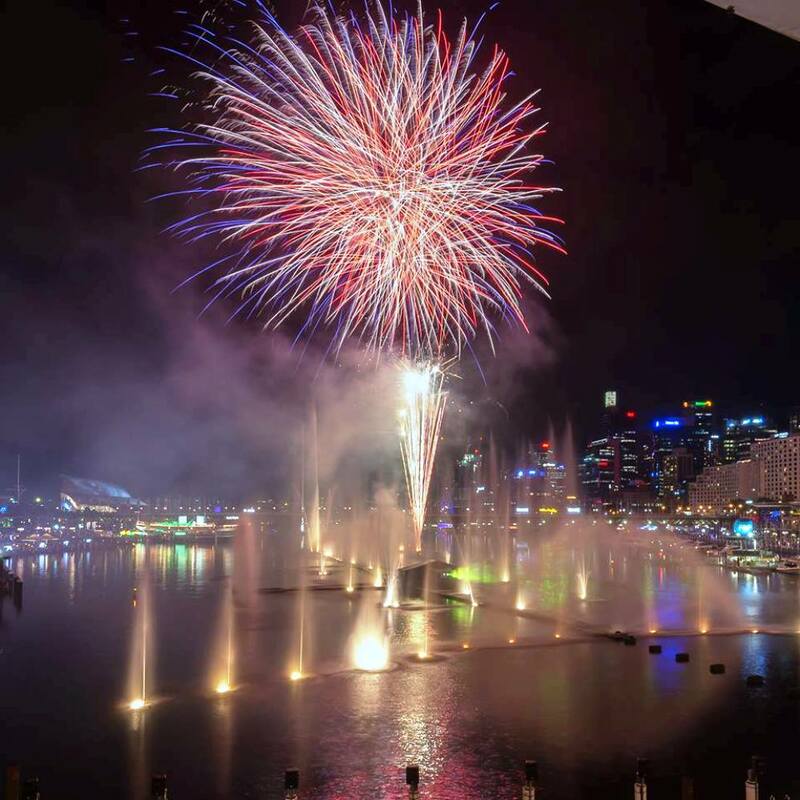 The spectacular show will be visible from many vantage points across the city including the Barangaroo / Darling Harbour / Pyrmont precinct. 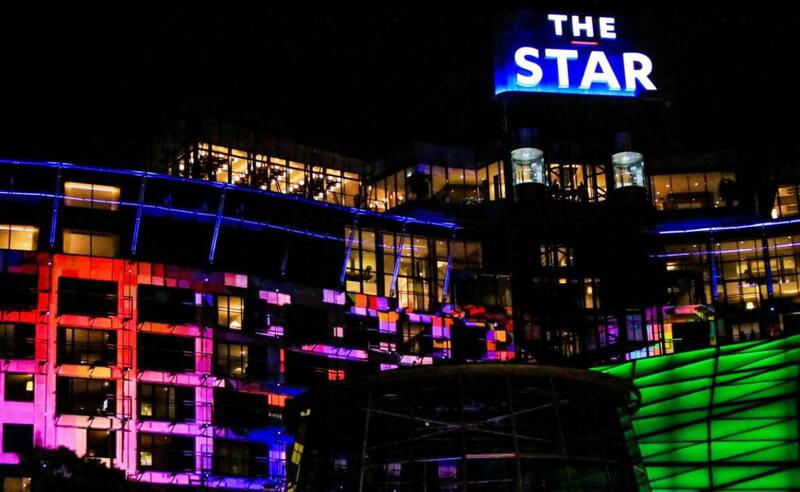 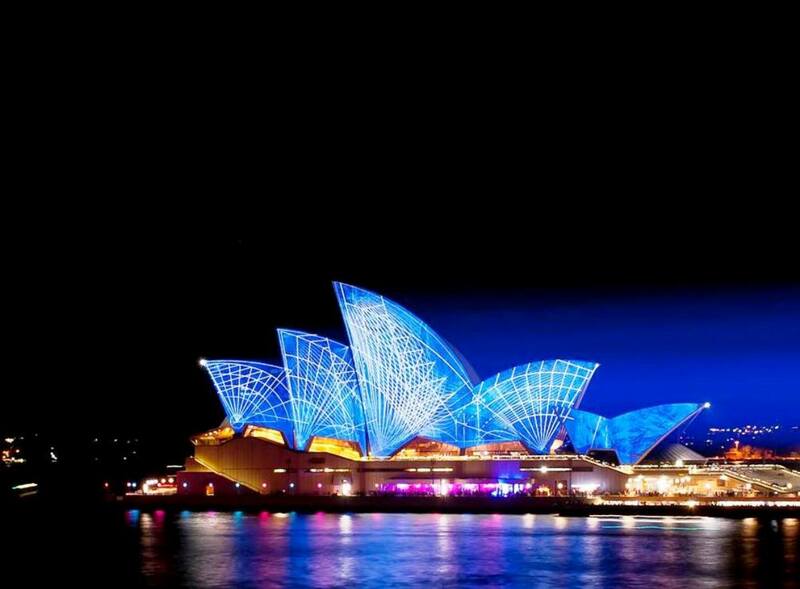 You will also be able to view highlights of Vivid Sydney from across the city in the Vivid Bar at The Star. 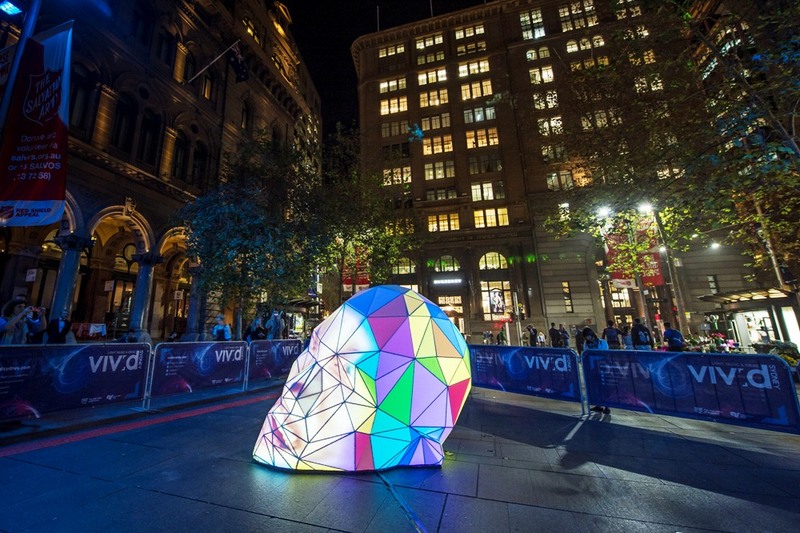 Vivid Sydney will be bigger and brighter this year, with a spectacular expansion into Martin Place, the city’s central business area, with nine lighting effects transforming the bustling thoroughfare into a gallery of light. 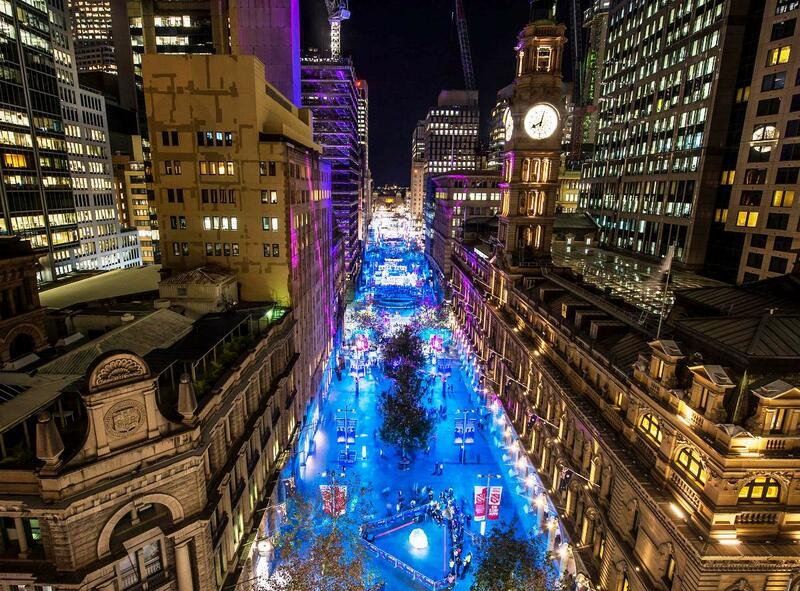 By bringing Martin Place and other areas of Sydney into the Vivid fold, we can create whole new vistas of light and wonder, and bring Vivid’s winter magic into the heart of the CBD. 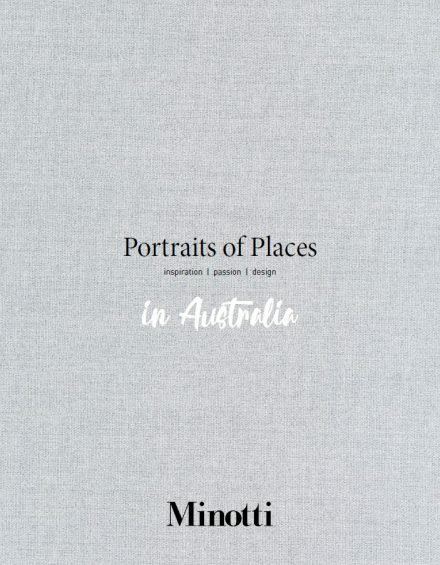 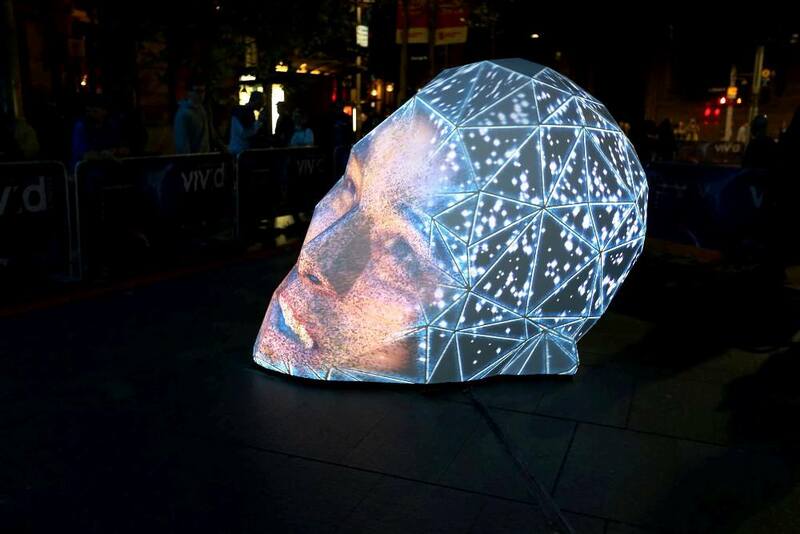 • Light sculpture, e|MERGEnce , commissioned by Destination NSW uses interactive 3D projection to map a person’s face onto a giant head through live video capture. 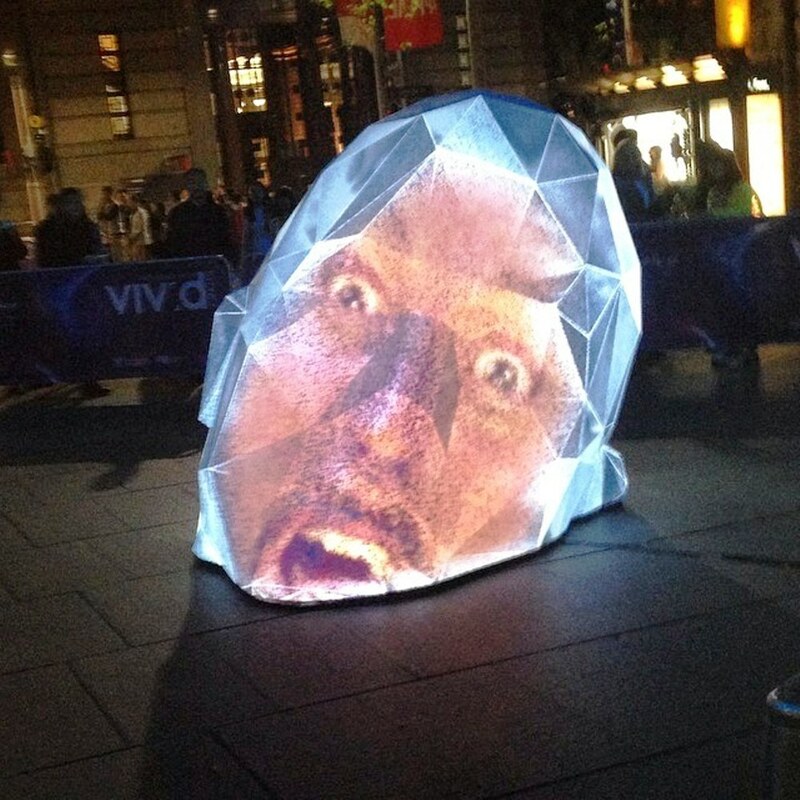 Building on the narrative of the designers’ Vivid Sydney 2012 sculpture, sub|version – which featured a giant figure submerged in the waters of Circular Quay – e|MERGEnce is the figure made real in the form of a huge, faceted head rising out of the solid pavement. 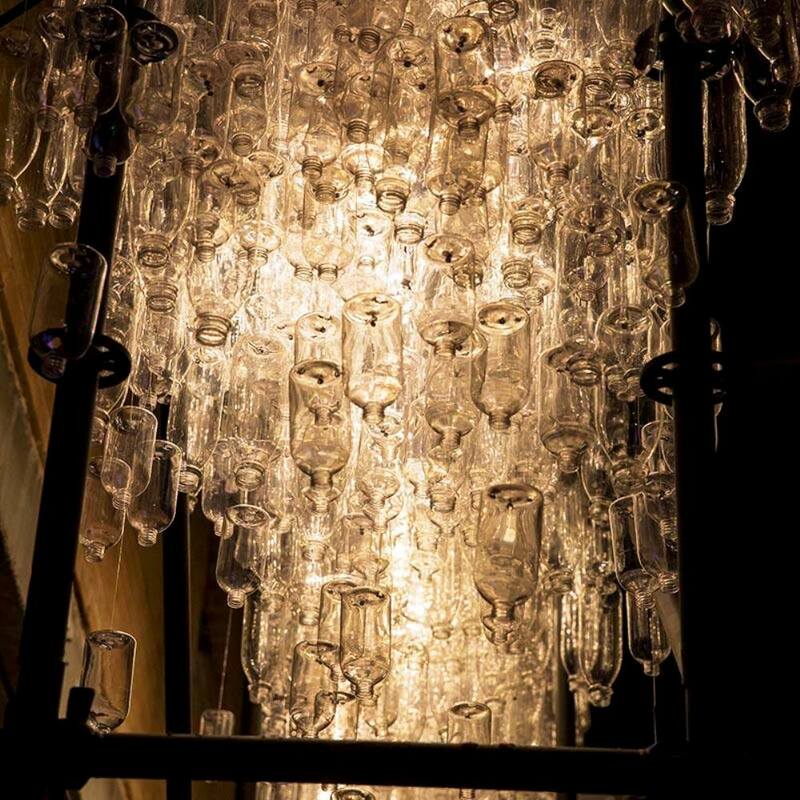 During the day the sculpture is a study in the reduction and abstraction of the human form to basic, albeit distorted, geometry. 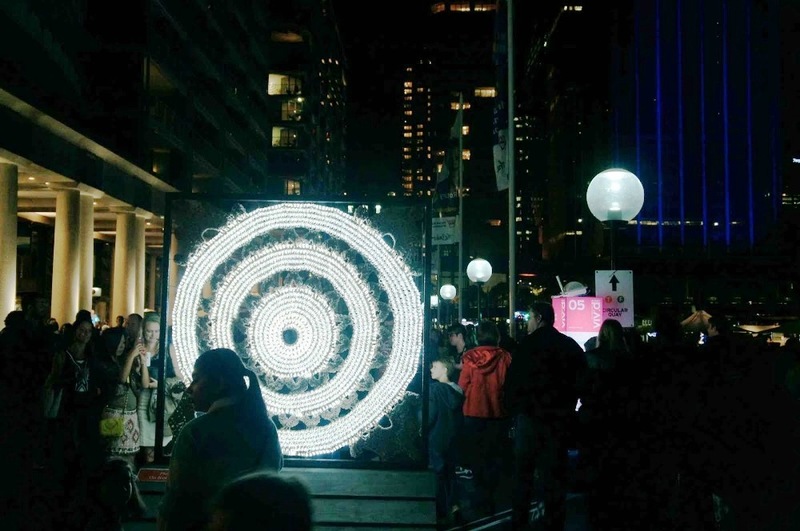 But when the sun sets and the Vivid Sydney lights turn on, e|MERGEnce transforms into an innovative, interactive light sculpture that plays on themes of scale, personality and image to invite you to see yourself as never before. 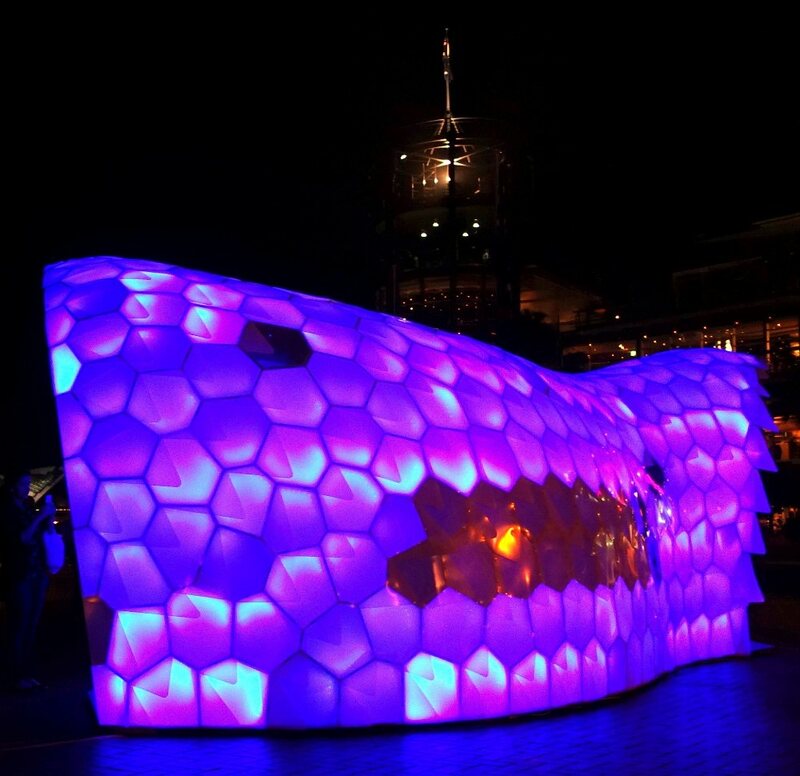 This architectural light installation, originally from BIG TANKS’ concept by Modulorbeat, is built from IBC (intermediate bulk container) tanks, which are reusable, stackable industrial containers designed to transport and store bulk liquids and grains. 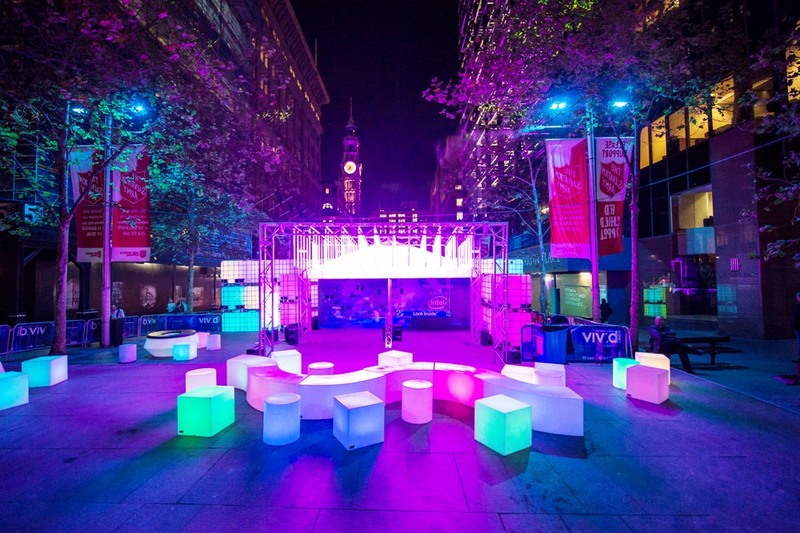 The cubes are placed to form a network of spaces with immersive lighting flowing through the integrated lighting system. 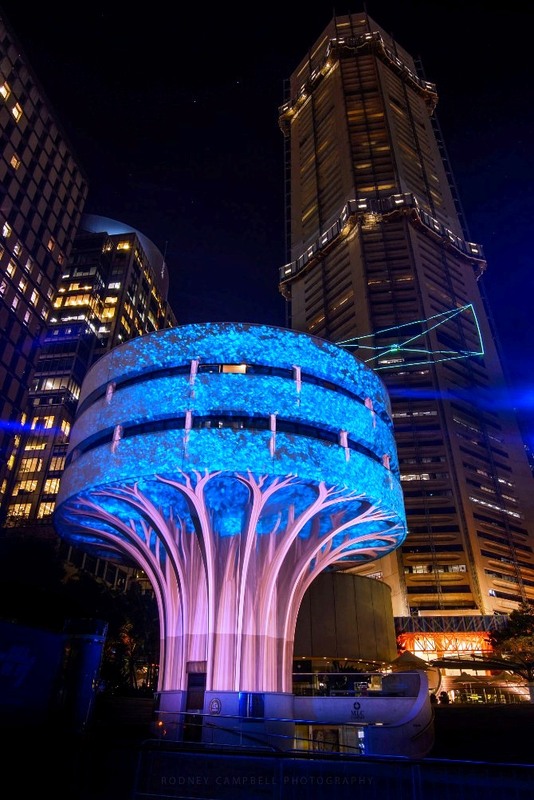 • An interactive Digital Forest of 120 LED 3D glowing tubes fronting a kiosk of electronic games and technology displays, installed by Vivid Sydney partner, Intel. 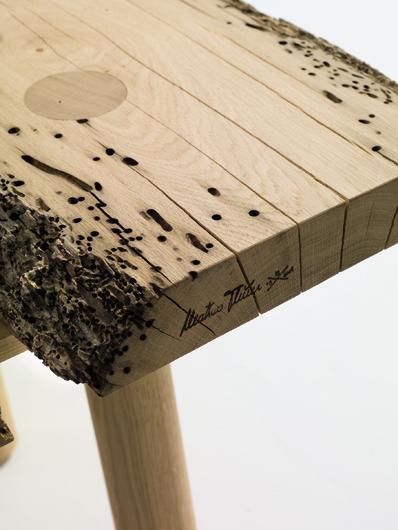 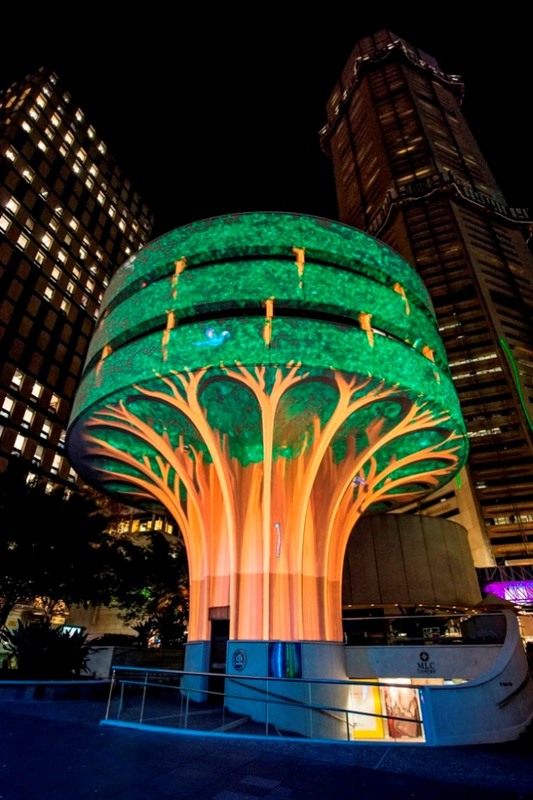 • The Urban Tree Project explores themes and questions relating to urban lifecycles, the impact of high – density living on the natural environment, and the human need for green space. 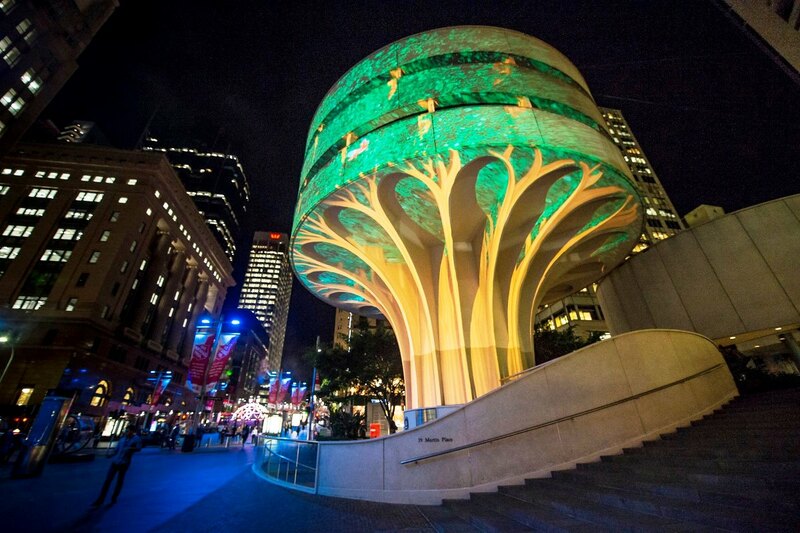 The Commercial Traveller’s Association (CTA) building (the iconic ‘mushroom’ by architect Harry Seidler), will be transformed into a ‘day in the life’ of a mighty forest tree.It will seemingly grow out of the ground and become a magnificent living tree, complete with birds within the surrounding urban environment, to celebrate and reflect on Sydney’s original bush landscape. 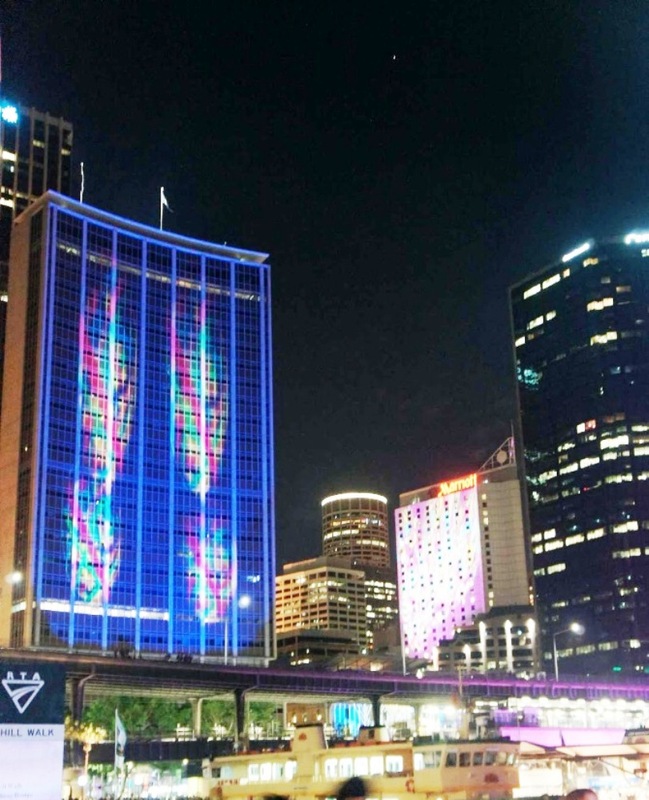 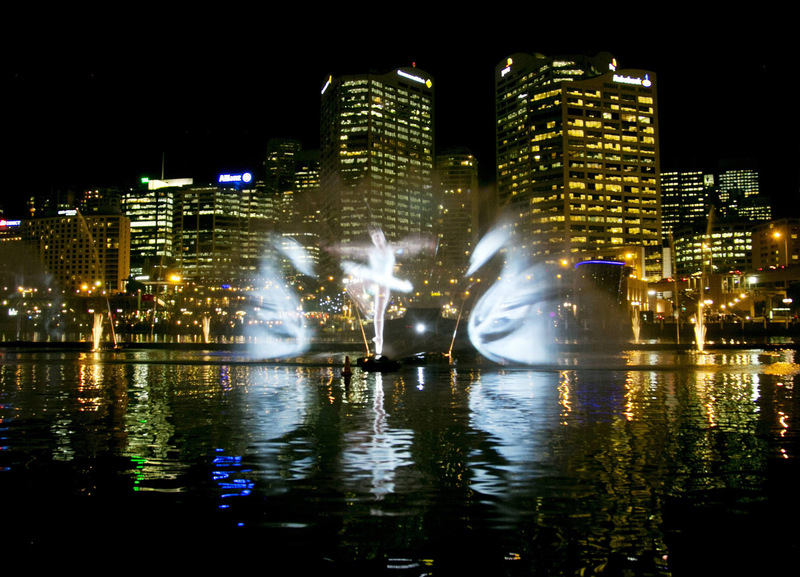 • Oracle Attractions’ Skycreeper sees MLC Tower become a soaring canvas for laser projections, transforming the full height of the Sydney landmark into a luminescent garden populated by twisting organic forms and curious creatures. 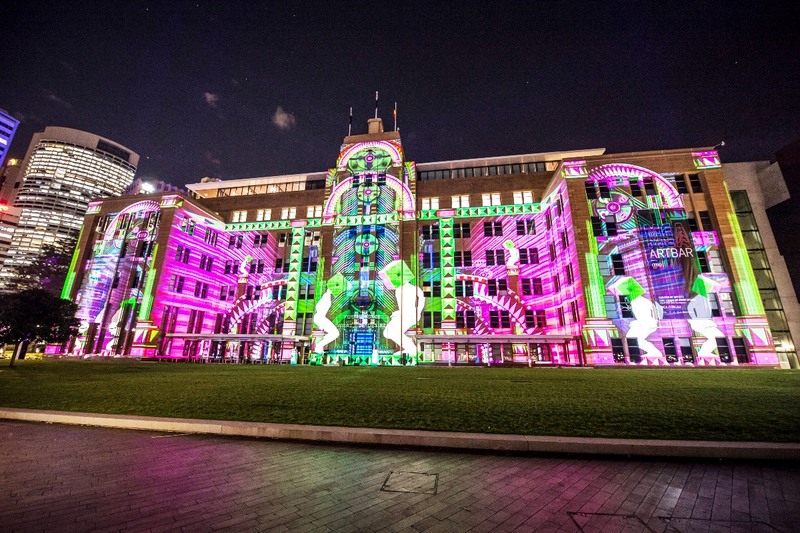 No longer is the building simply an architecturally designed home to various commercial and retail businesses.It is as if nature’s power insidiously breaks through, claiming the concrete as its domain, allowing its biological forms to hold sway over human creations. 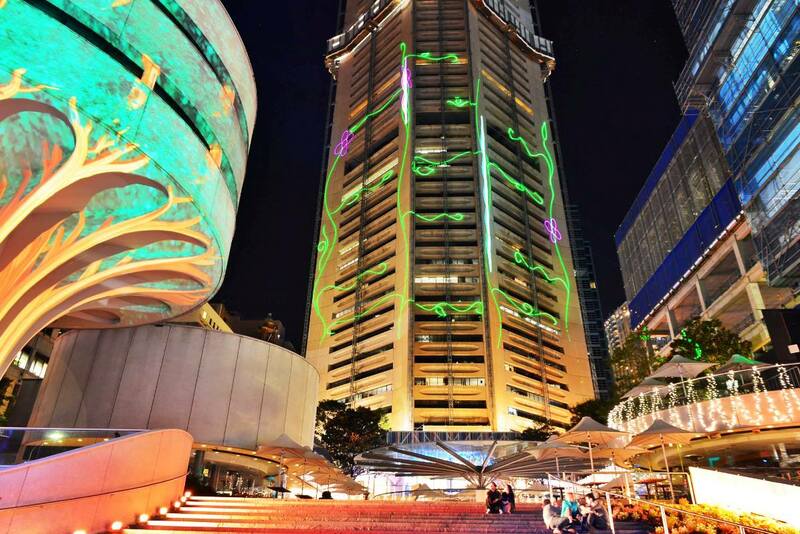 The iconic geometry of the building, designed by renowned architect Harry Seidler, is traced by glowing lines of laser light.Giant vines snake their way up the building, twisting and turning around windows, pushing their way up to the skies. 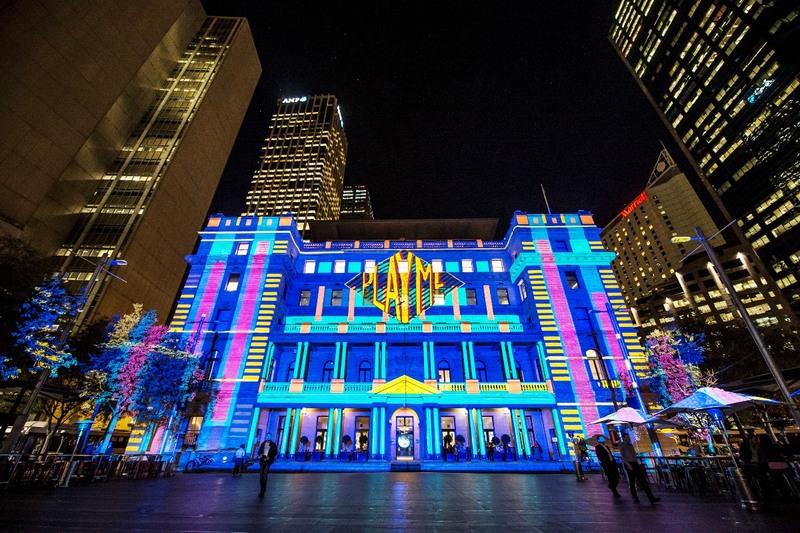 The installation uses full-coloured OPS laser systems, which are positioned on surrounding rooftops and purpose-built towers, to fully cover the building’s Martin Place façade. 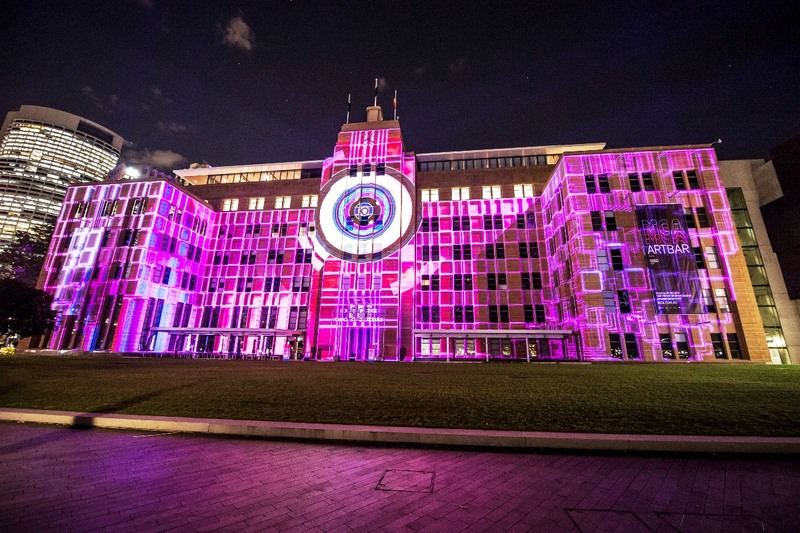 The laser systems are then wirelessly networked, to run the animation as one seamless piece across all projectors. 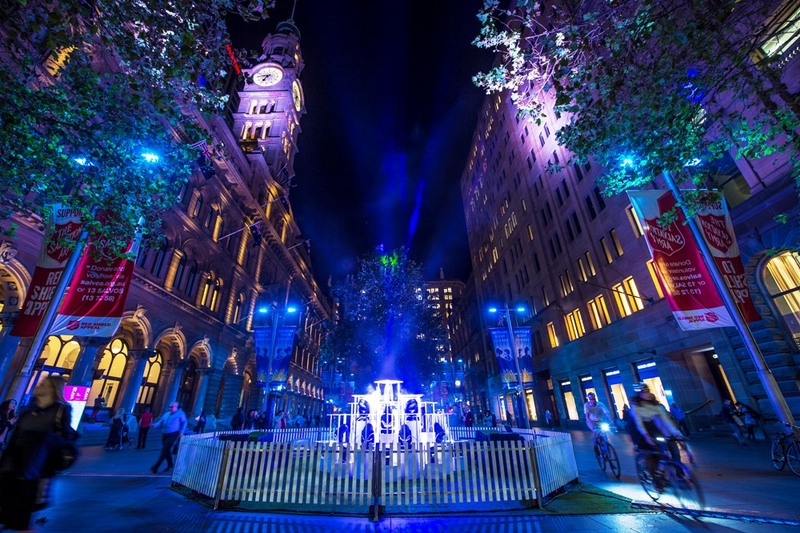 • Beneath the Beams, a shimmering mass of green and gold lasers which will be projected between the Sydney Eye Hospital on Macquarie Street and George Street’s Burberry building, providing a unique ceiling for Martin Place. 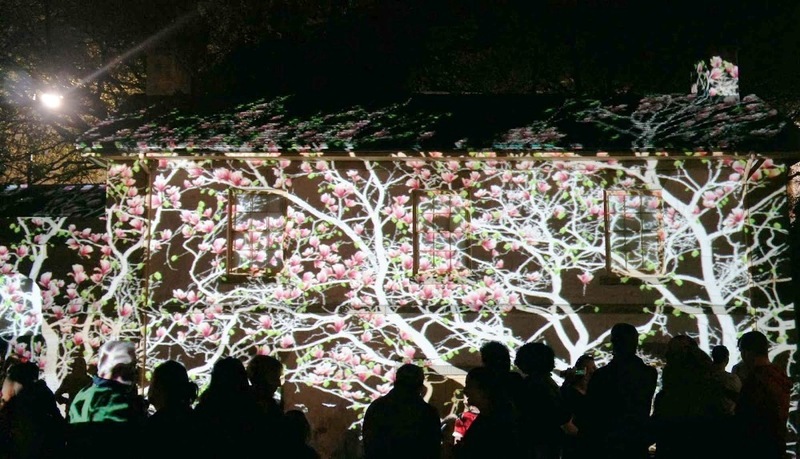 • Sky Flower , an elegant ‘chrysanthemum of light’ which will illuminate the night sky with petals of light which will unfold in a moving hymn of changing colour. 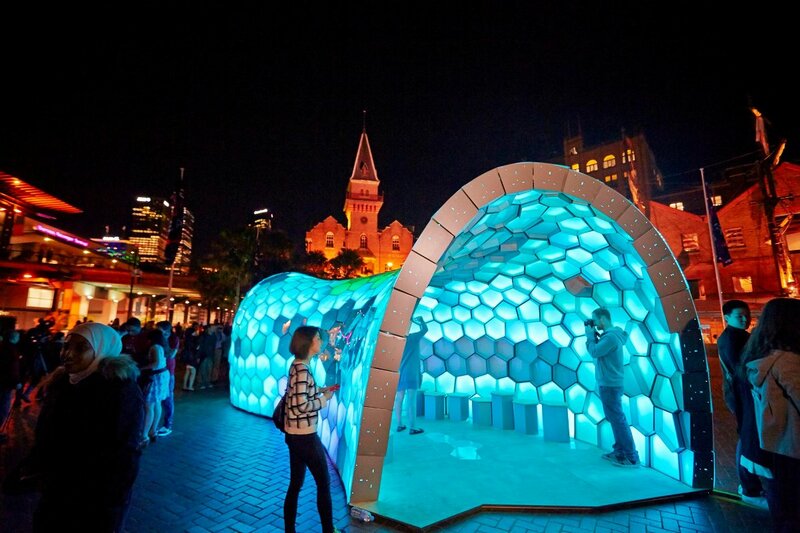 • GEO GLOW a whimsical blend of art and architecture, a tribute to the philosopher – architect Buckminster Fuller. 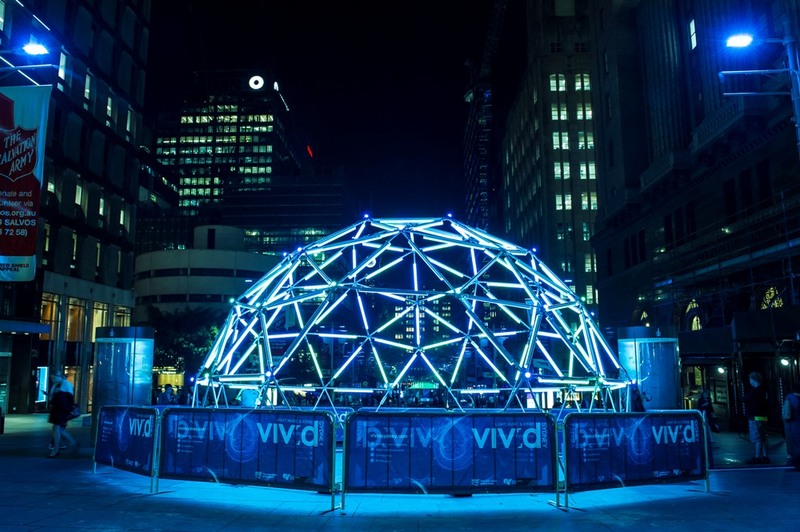 Using pixel-mapping technology in a 3D environment, this striking structure is made of 120 LED Happy Tubes and LED pixel-spots. 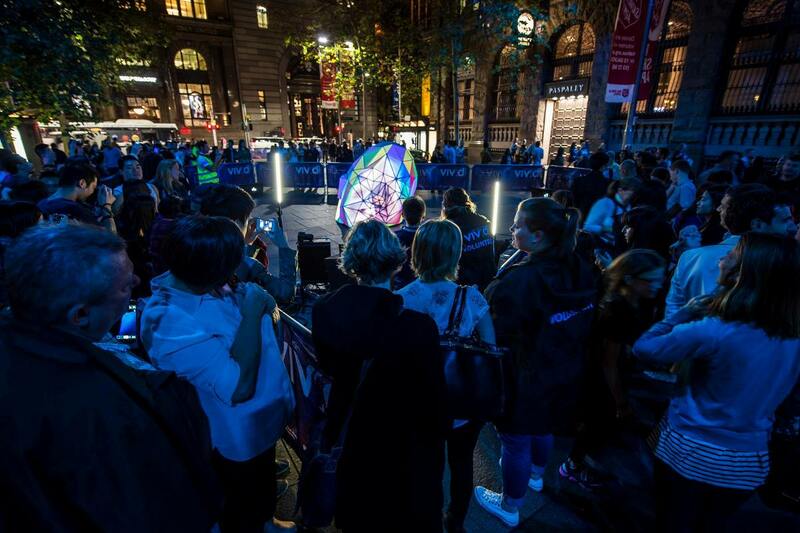 Three touch-screen tablets wirelessly control the rotation, colour, effect and intensity of the lights, making Geo Glow illuminate its urban surroundings and allowing you to immerse yourself in this luminescent experience. 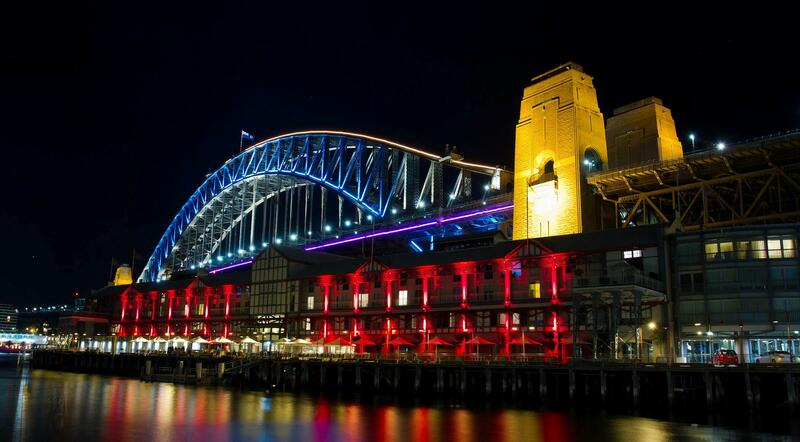 • Vivid Sydney also pays homage to the Australian Armed Forces by respectfully lighting the Cenotaph in recognition of those who have fallen in service of our country. 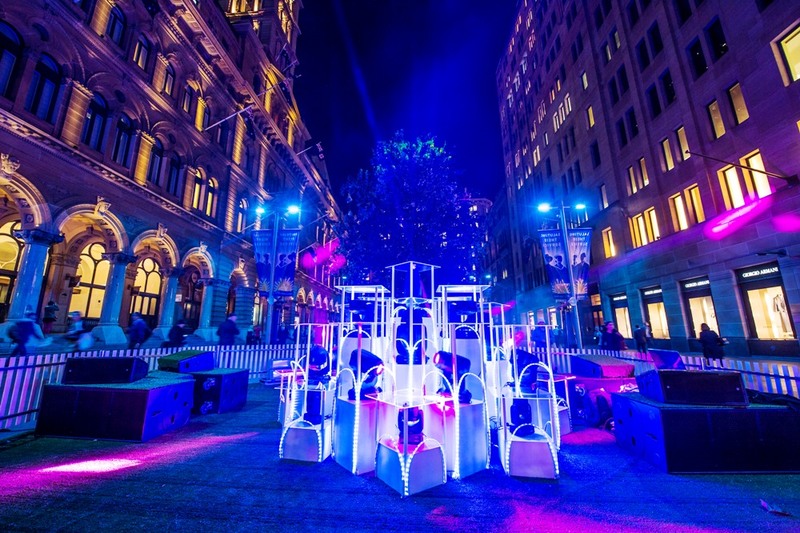 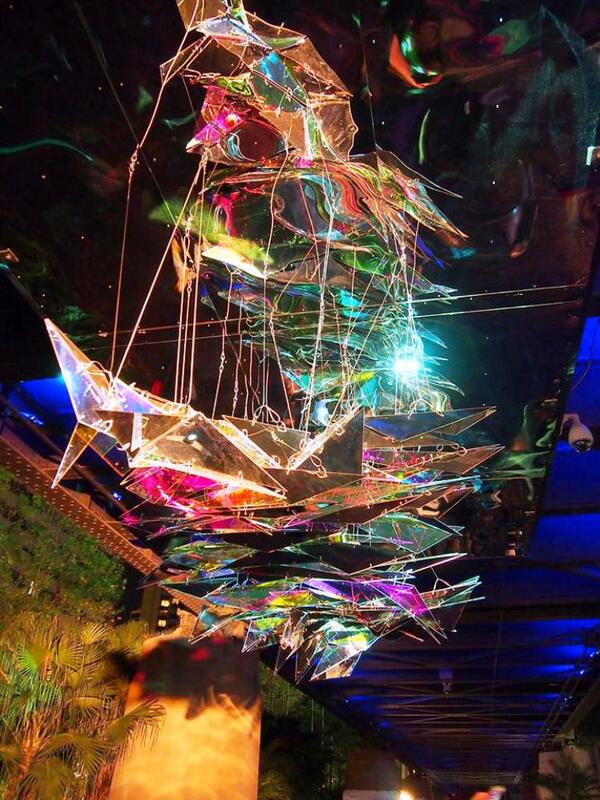 On either side cutting-edge lighting and the latest in experiential interactivity are combined with great artistry to create beautiful installations. 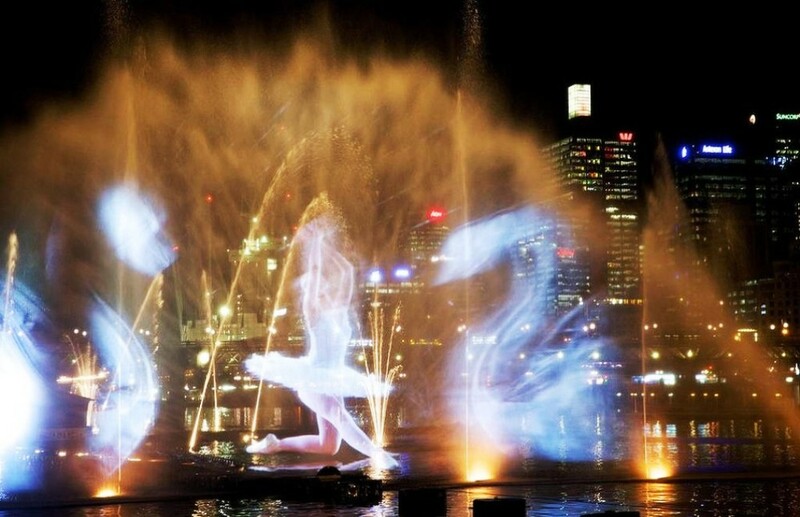 Is it a real flower or just an apparition? 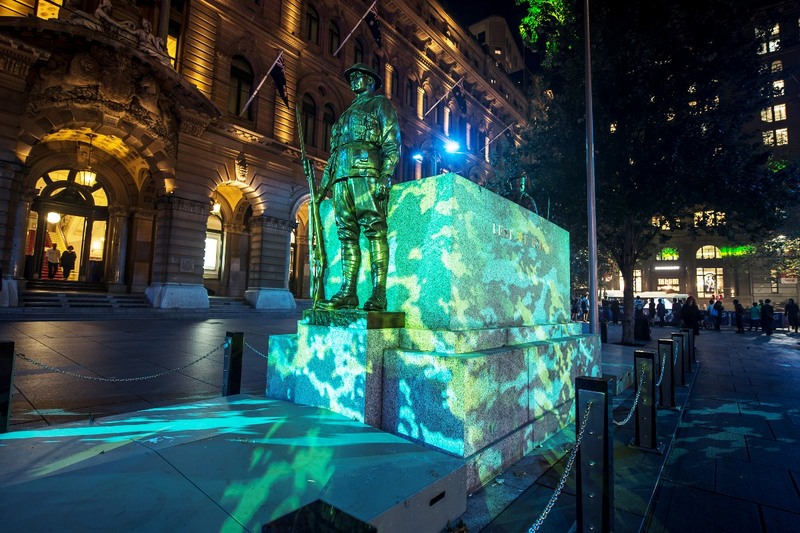 At the very location where thousands of Sydney’s soldiers enlisted into the Australian Armed Forces for World War I, Martin Place’s most recognised feature silently anchors this bustling thoroughfare as a 20-tonne granite icon and sign of respect to those who have fallen in the service of their country. 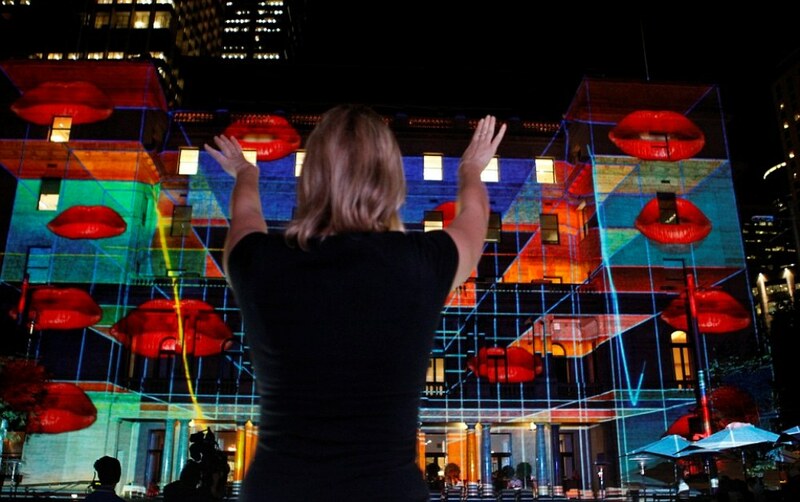 During our celebration of art, light and music, Vivid Sydney pays homage to the Cenotaph and its power to bring people together silently, respectfully and gratefully. 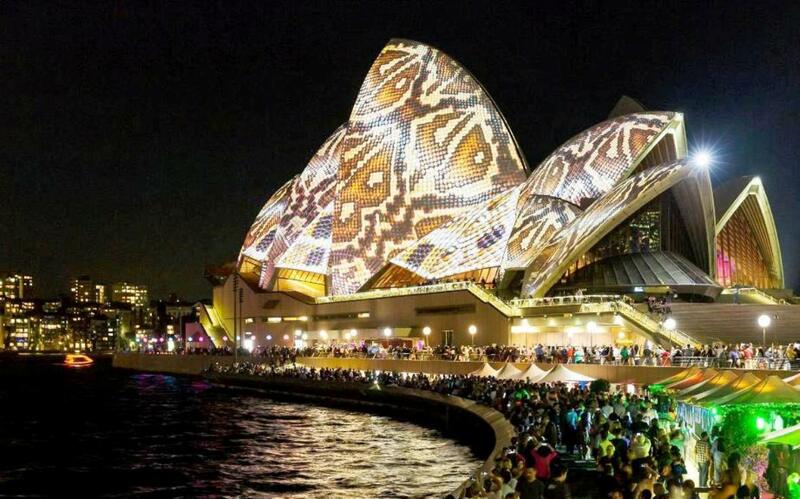 This year’s Vivid Sydney will feature some of the biggest names in the creative industry such as David Attenborough and Grace Jones. 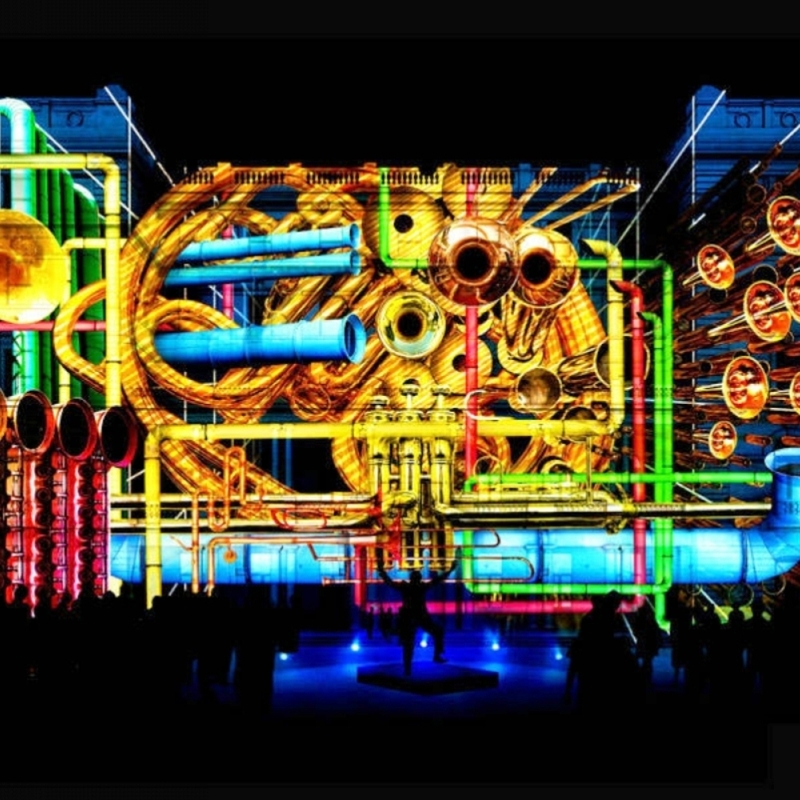 I am actually excited to see a giant Pacman robot complete with a glowing LED ghost with and 3-meter maze. 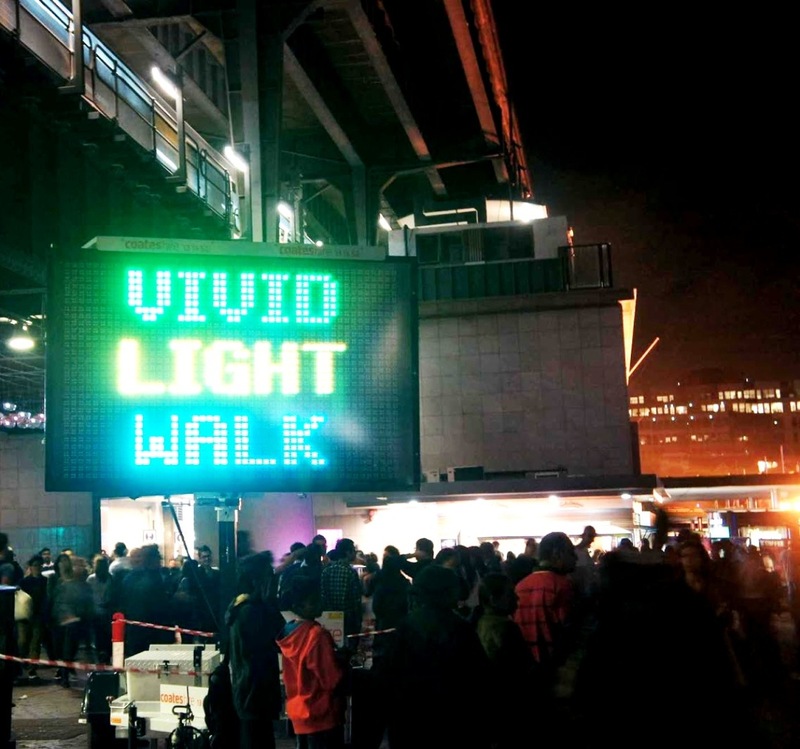 It will be led by a group of students from Univesity of South Wales, turning a popular video arcade game into real life creation. 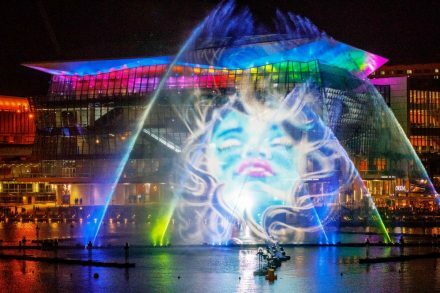 Last year, the light exhibition reached 1.43 million visitors in 18 days with 270,000 attending the opening weekend alone. 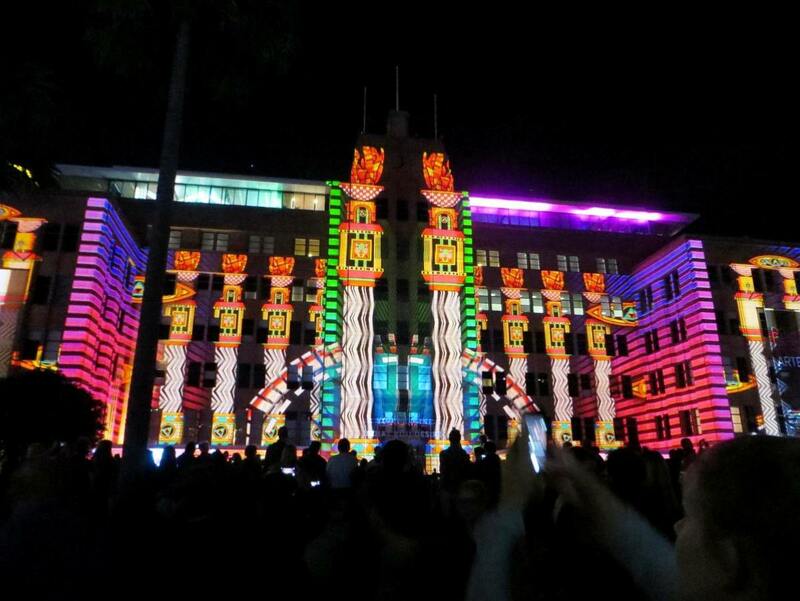 I think this year, more people will be attending and vivid lights are attracting lots of tourist for around the world. 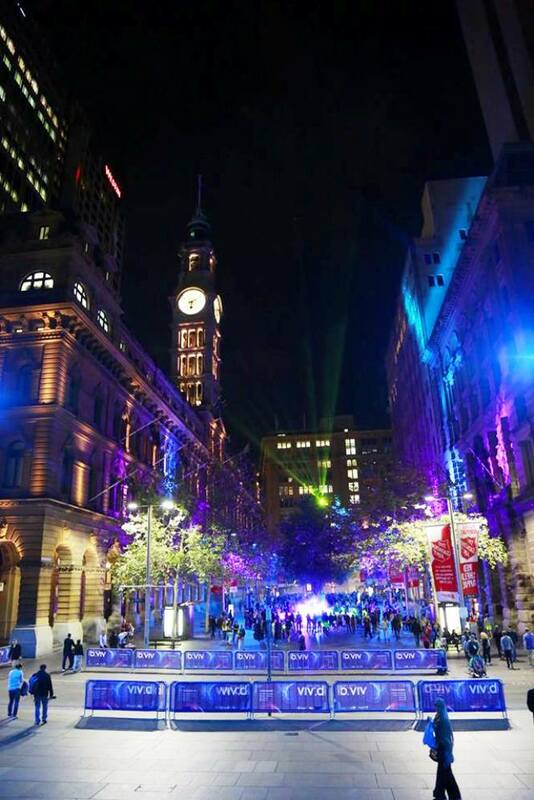 I attended last year, but that was only by foot, walking around the city, taking pictures until the battery runs out. 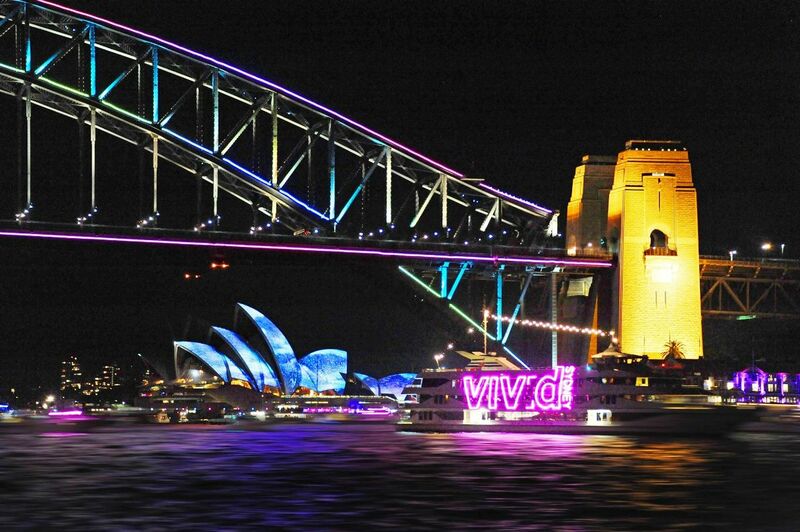 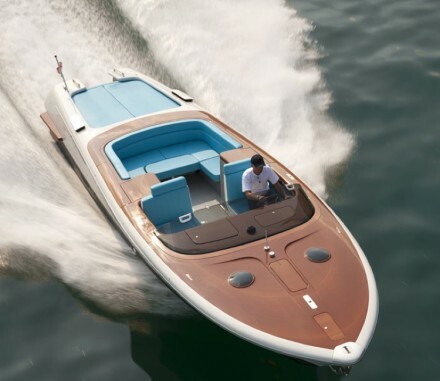 This time I will be boarding vivid lights cruises. 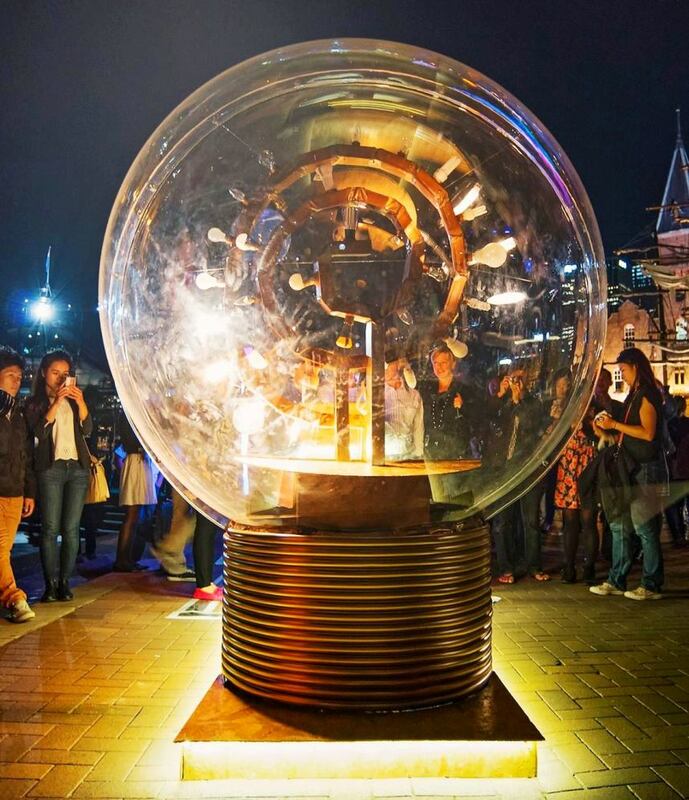 I hope I can still get a good view of the giant Pacman robot. 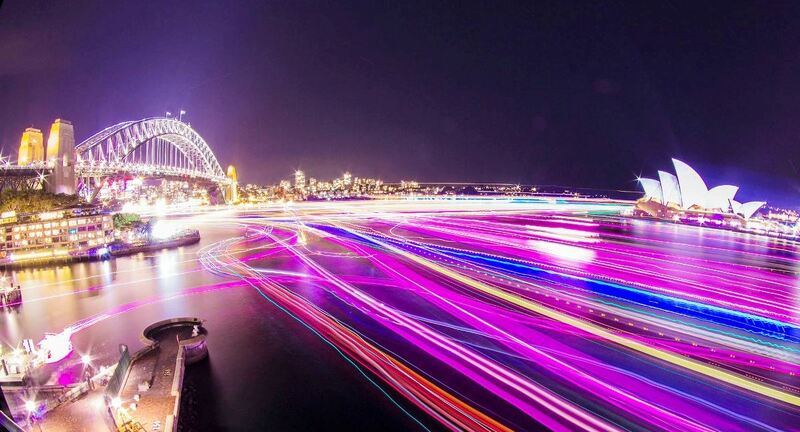 congratulations to these pictures, they are awesome. 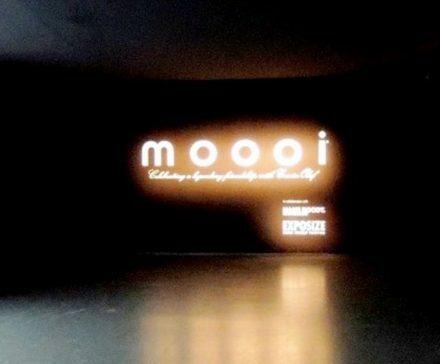 I was there in 2014 and was really impressed.